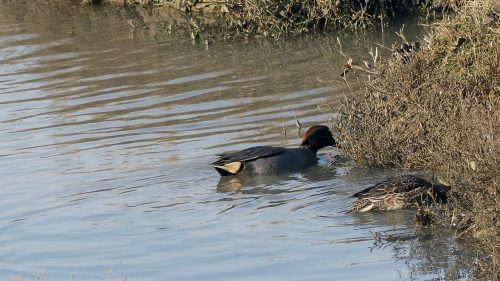 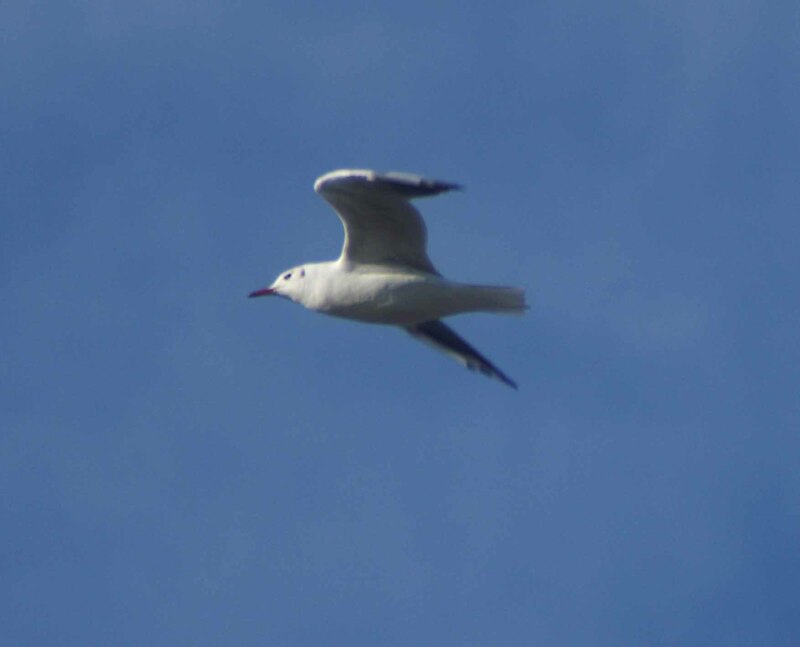 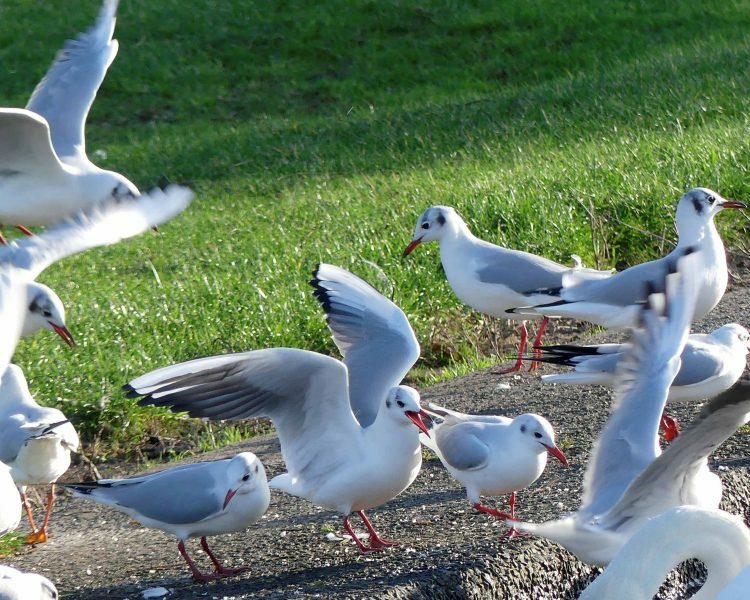 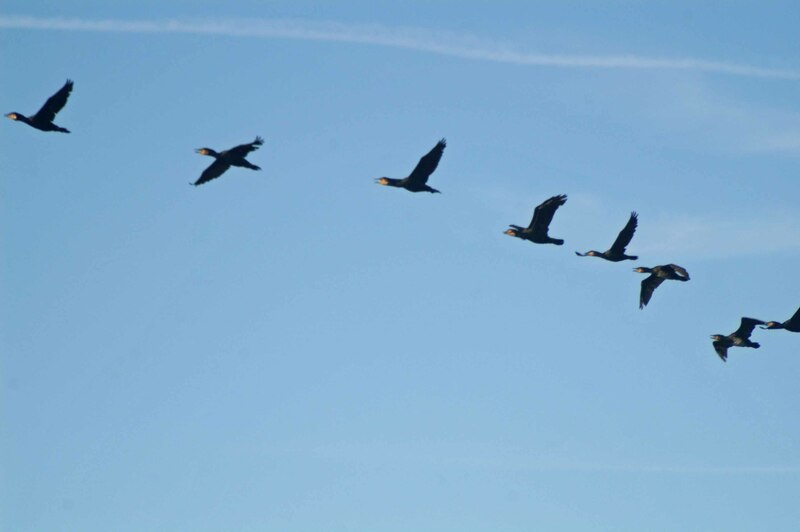 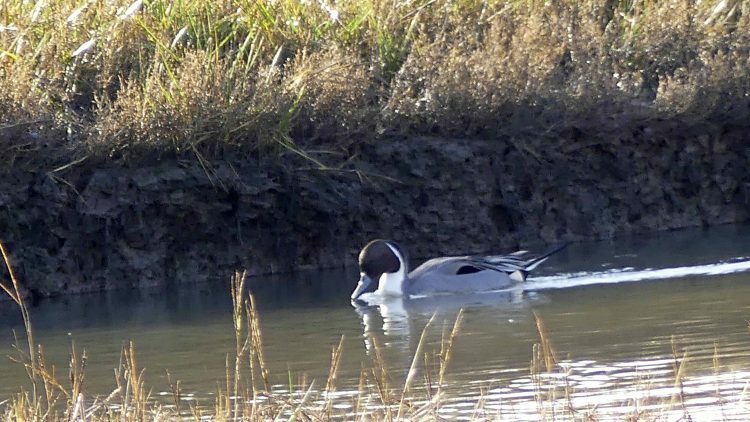 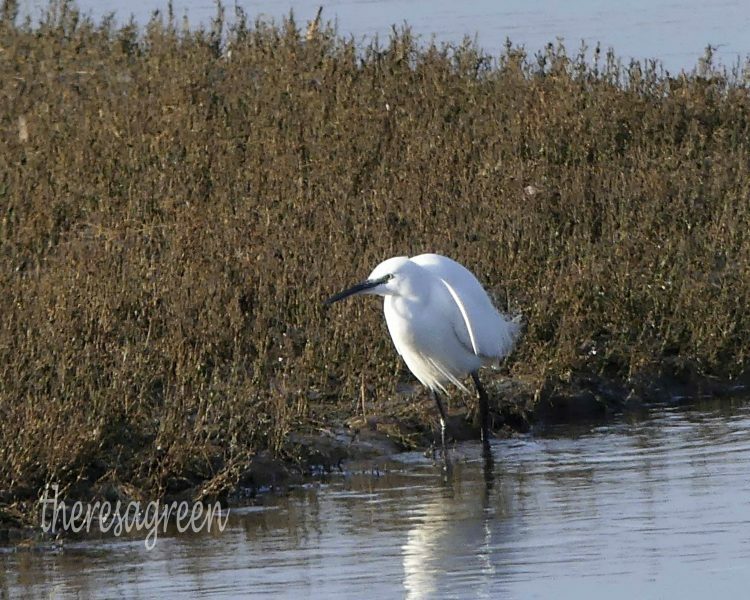 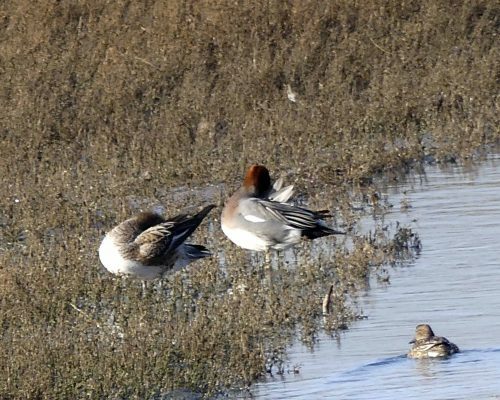 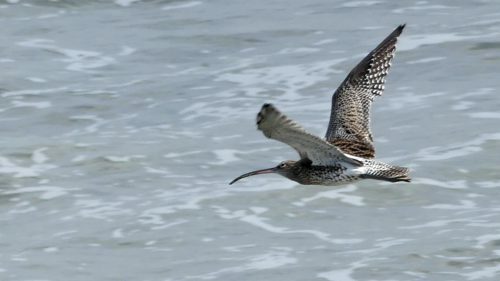 The summer is rapidly coming to an end and many species of birds are on the move, some returning to their winter feeding grounds in this country, others flying in from the north and others taking off to return to the warmer regions of Southern Europe and Africa. 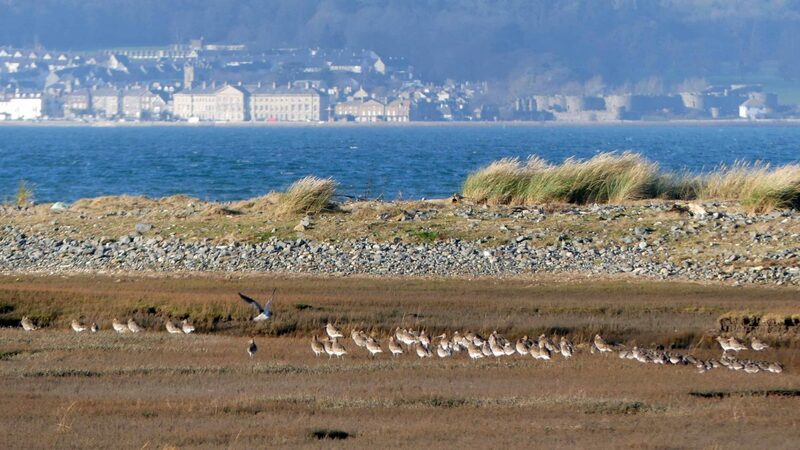 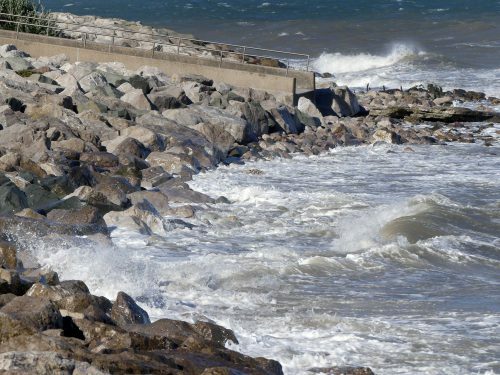 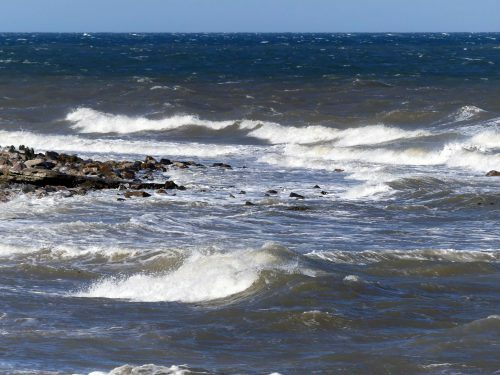 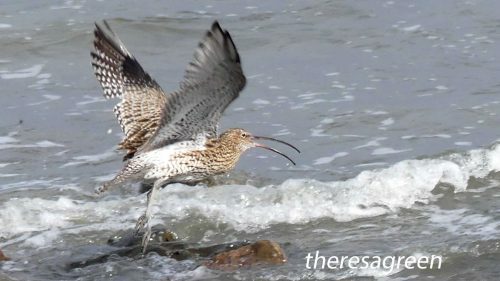 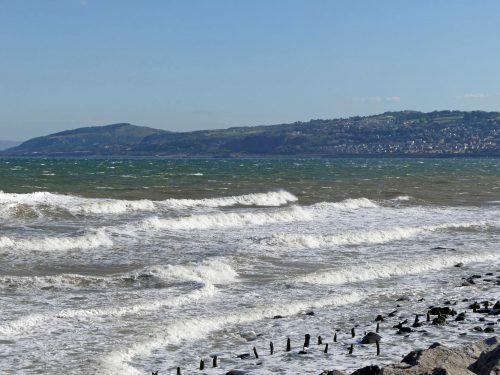 During the past few weeks I have already noted that the numbers of Oystercatchers and Sandwich Terns have increased dramatically here at Rhos-on-Sea on the North Wales coast and that Curlews have become a regular sight foraging on the seashore. 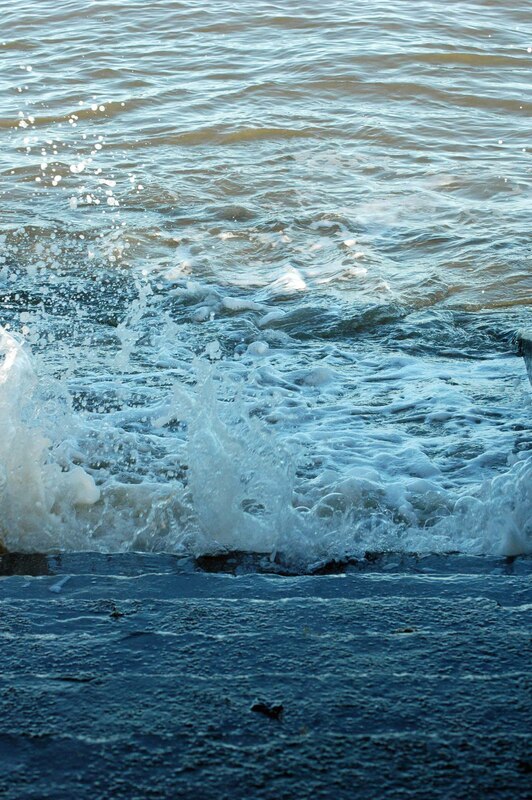 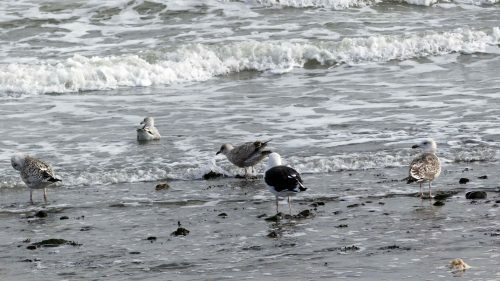 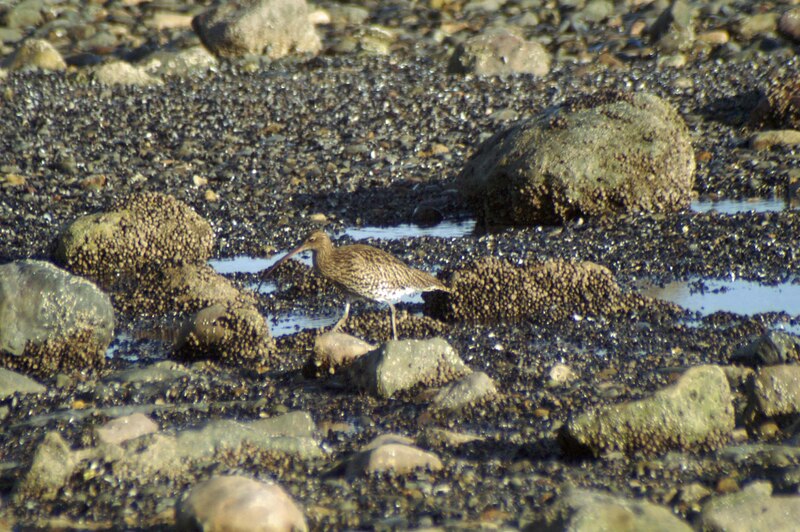 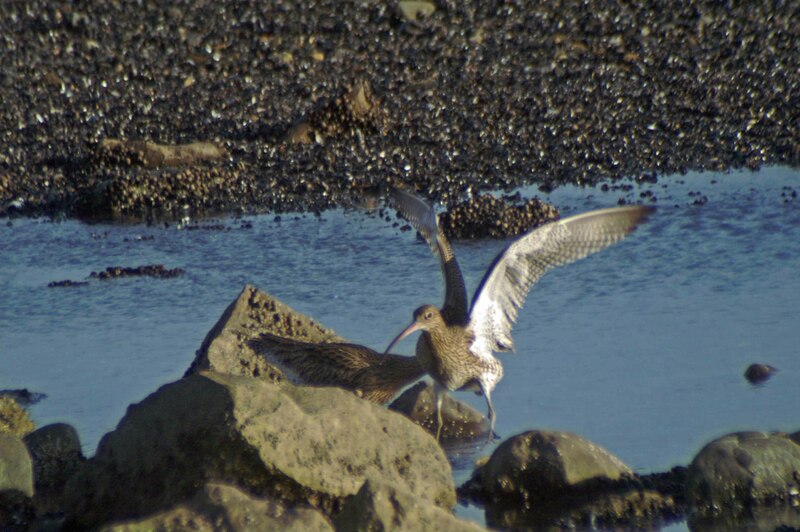 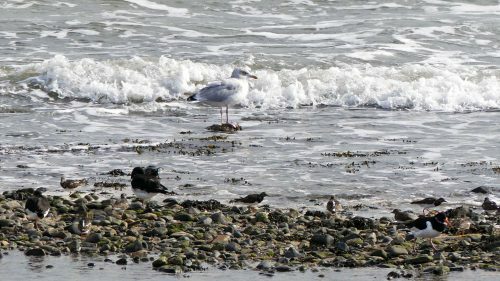 There was a lot of activity on the seashore late in the afternoon as the tide turned. 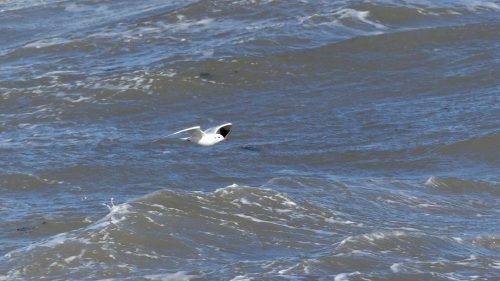 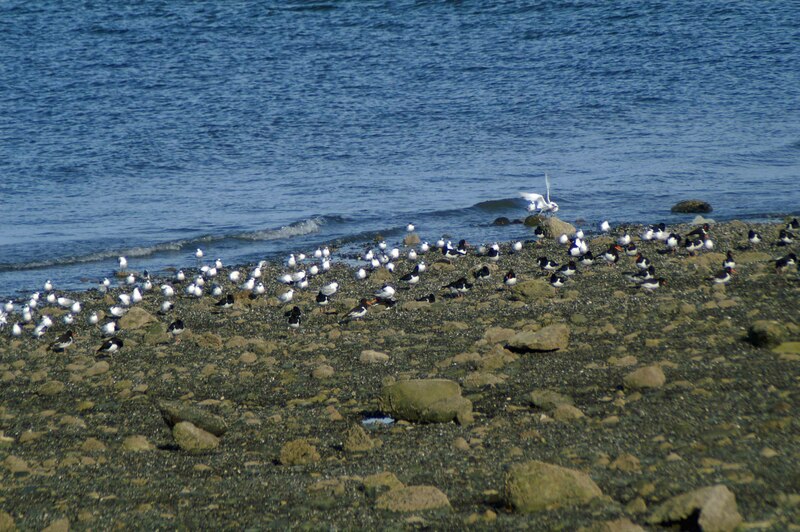 I’m not the best at counting large numbers of birds, especially when they’re mobile, but there are definitely several hundred Sandwich Terns here presently and even more Oystercatchers. 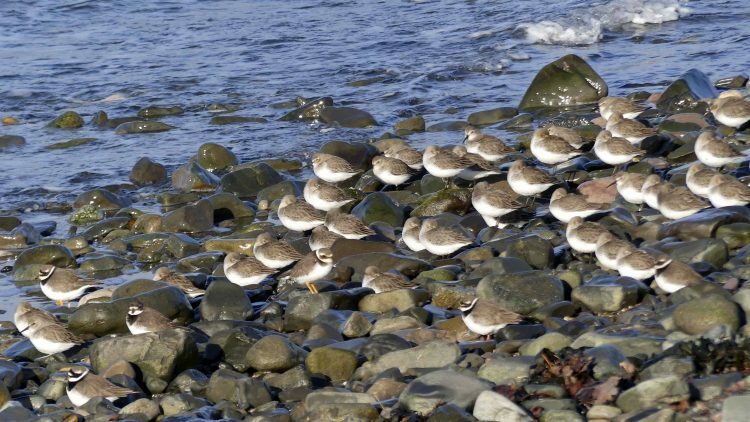 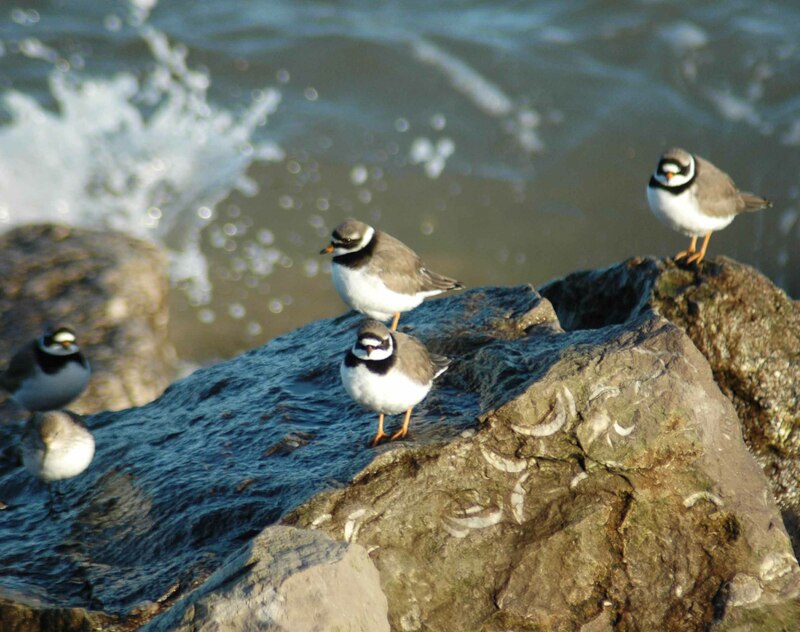 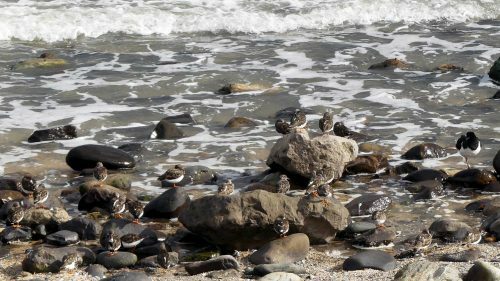 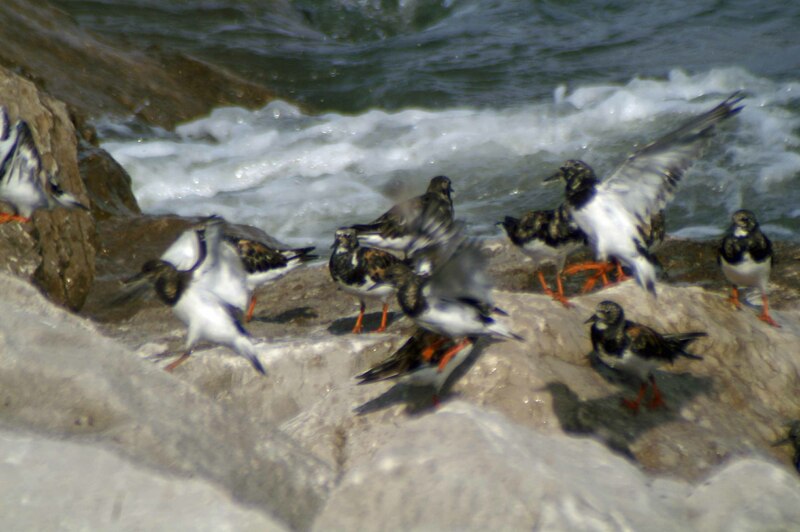 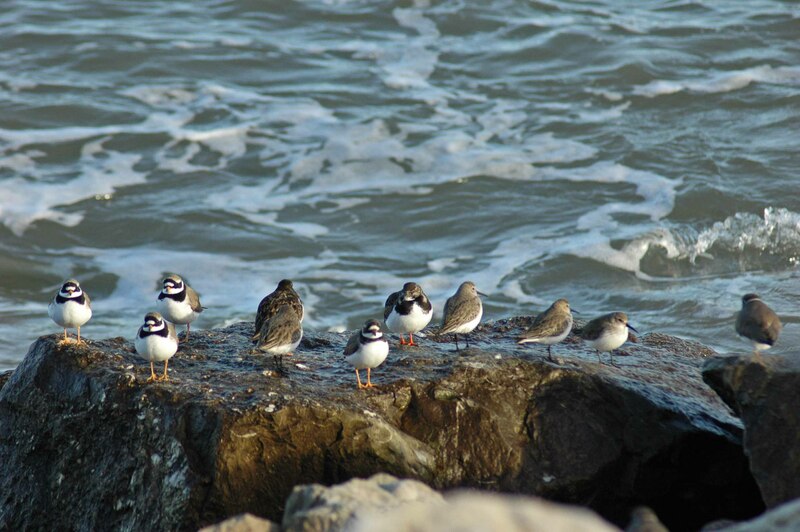 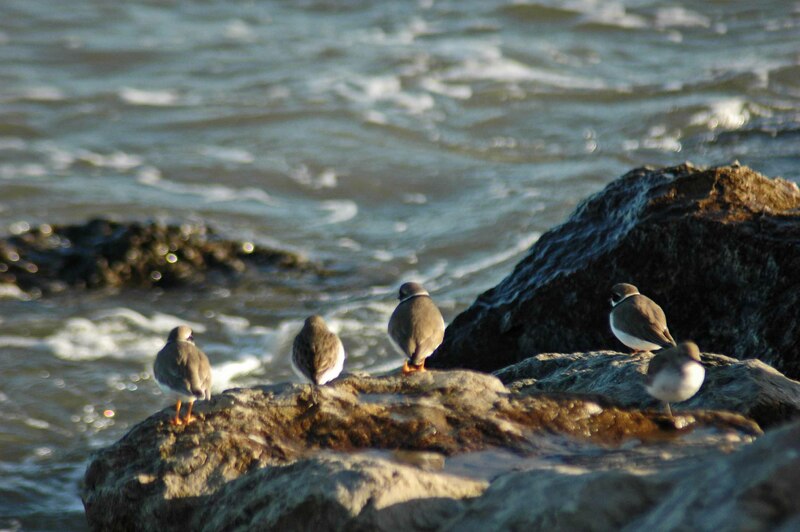 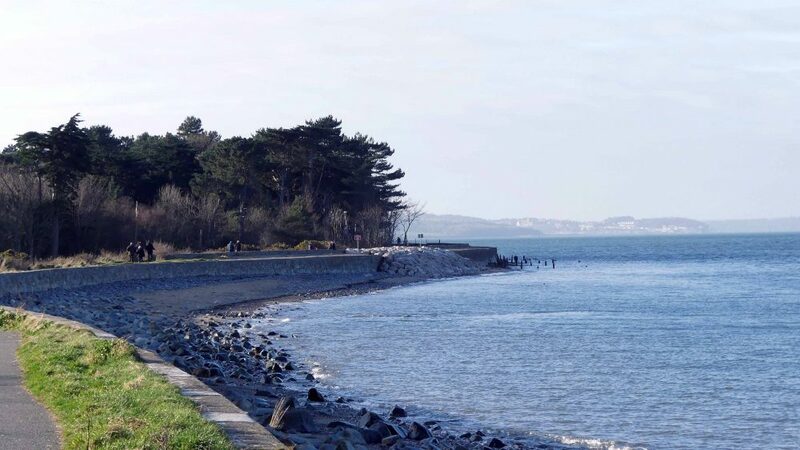 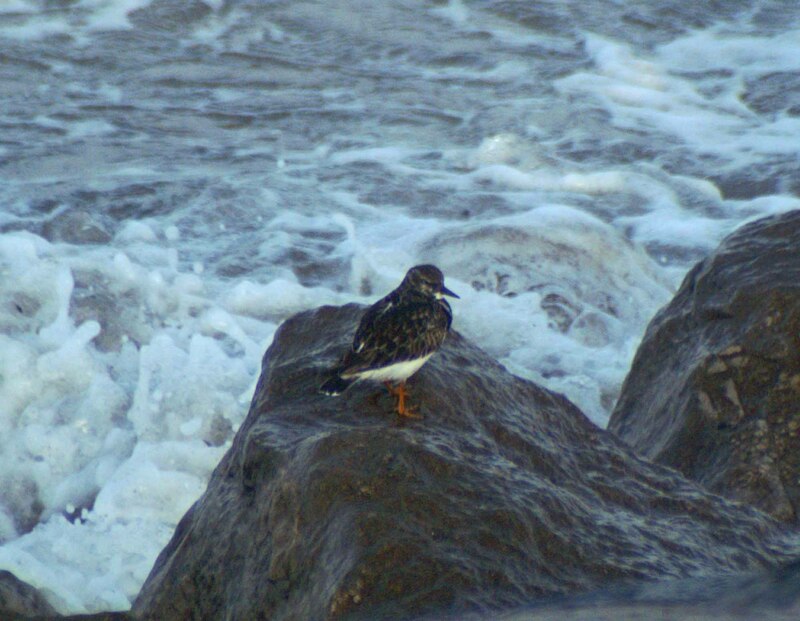 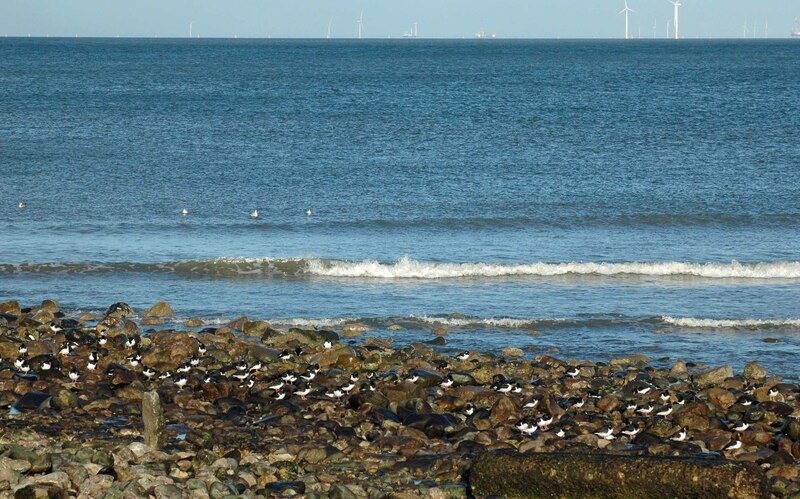 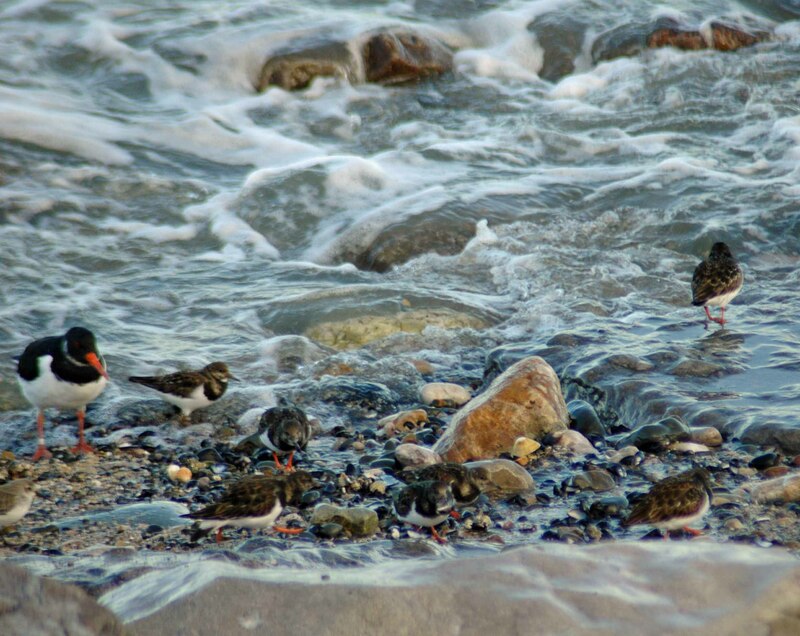 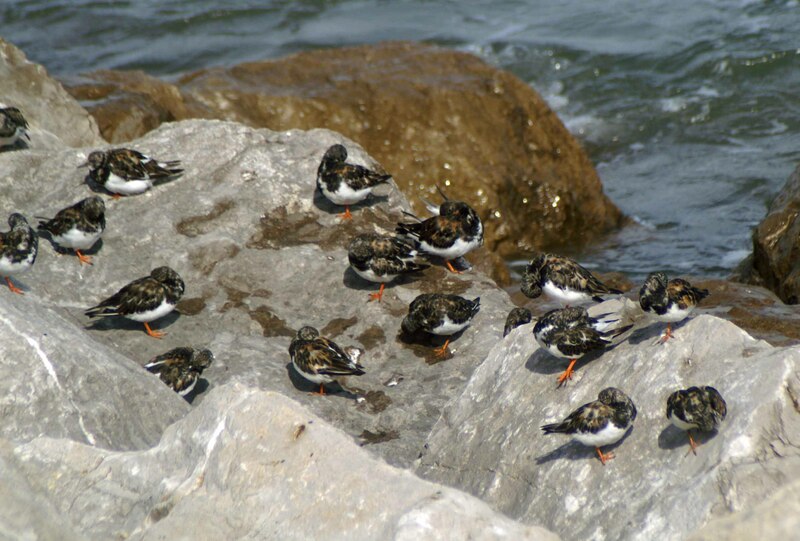 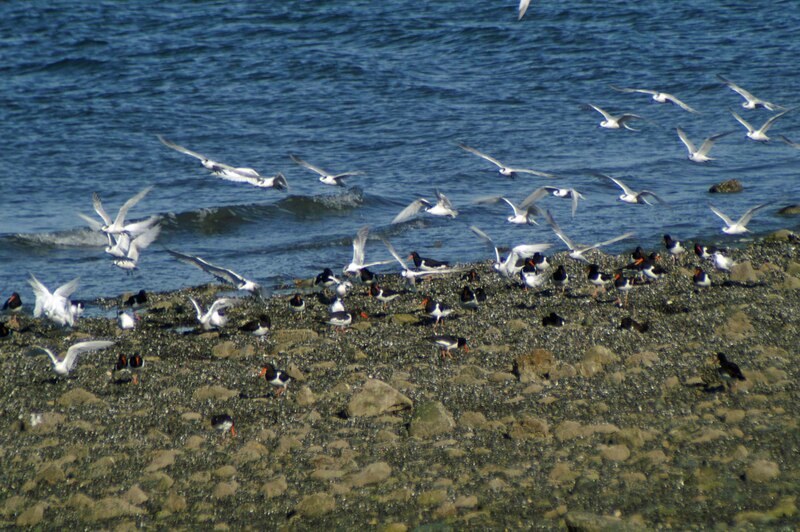 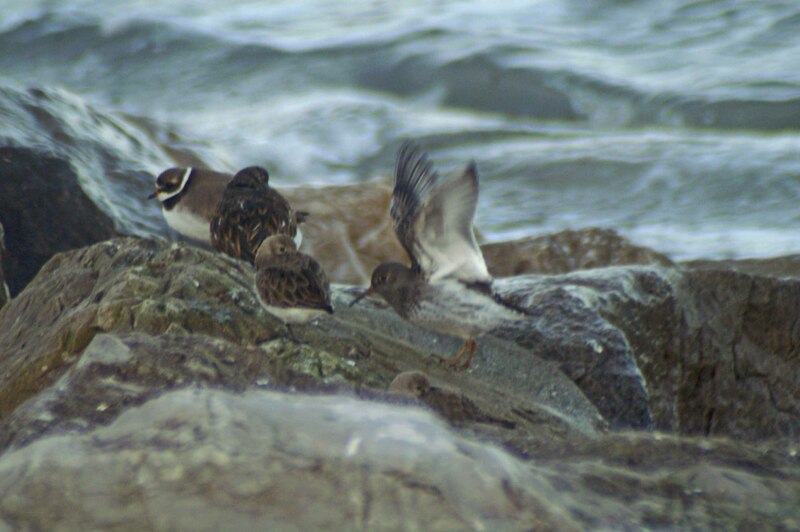 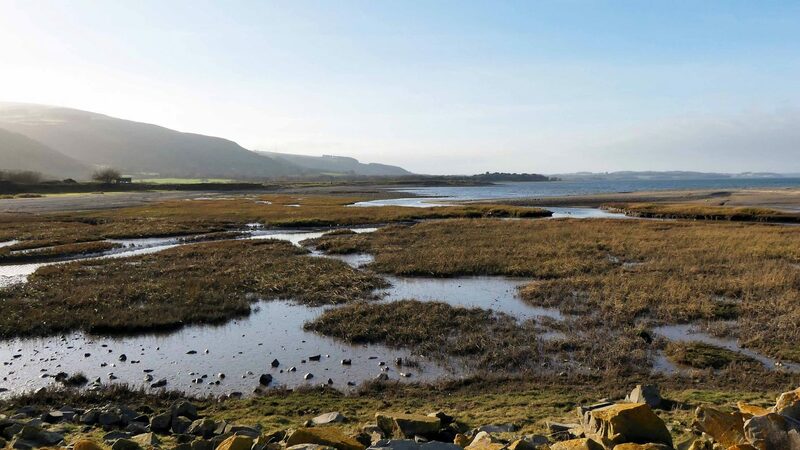 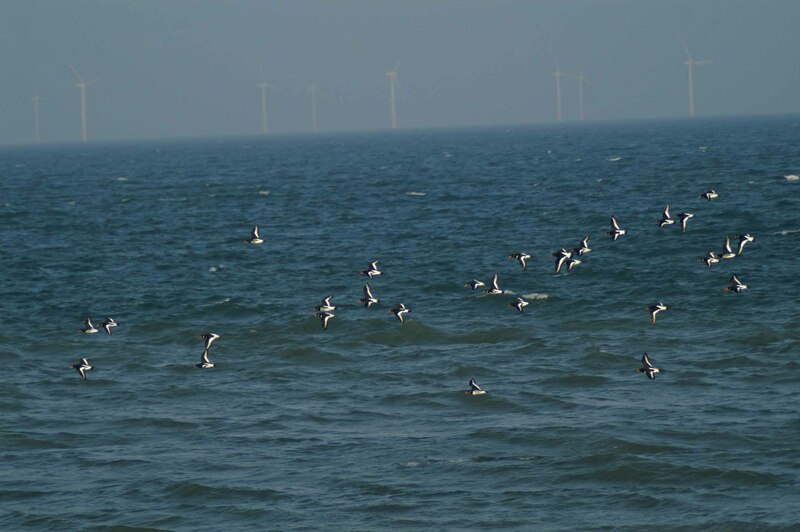 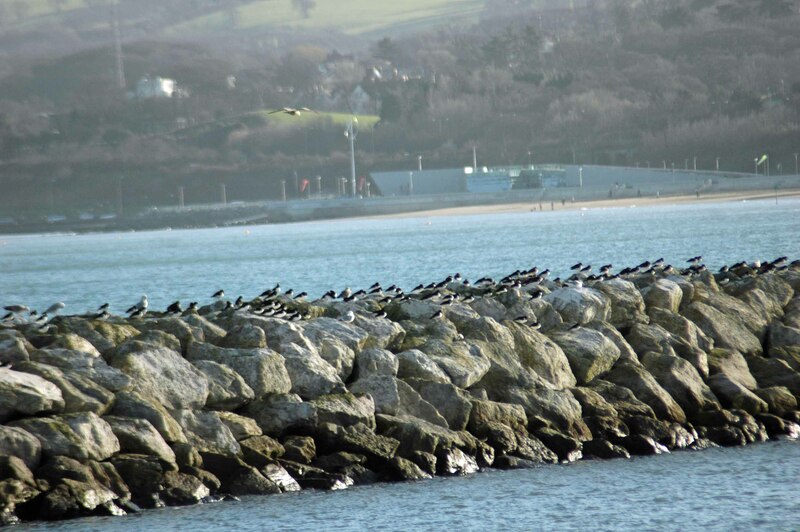 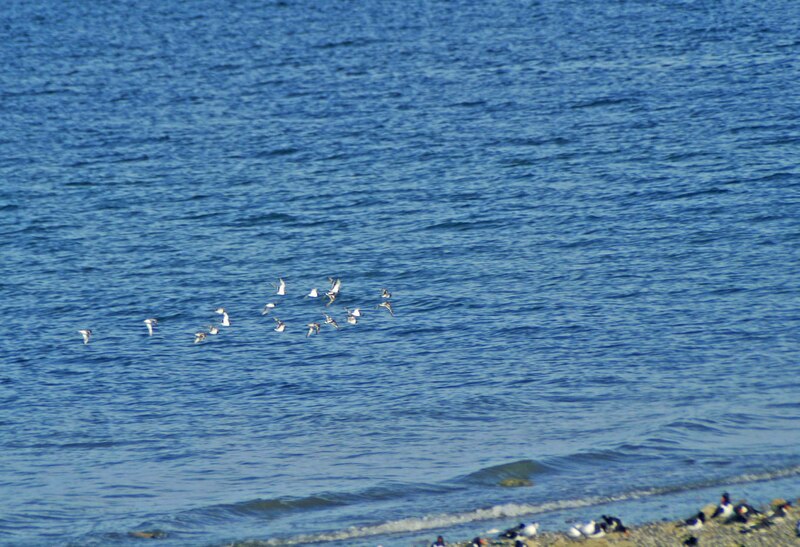 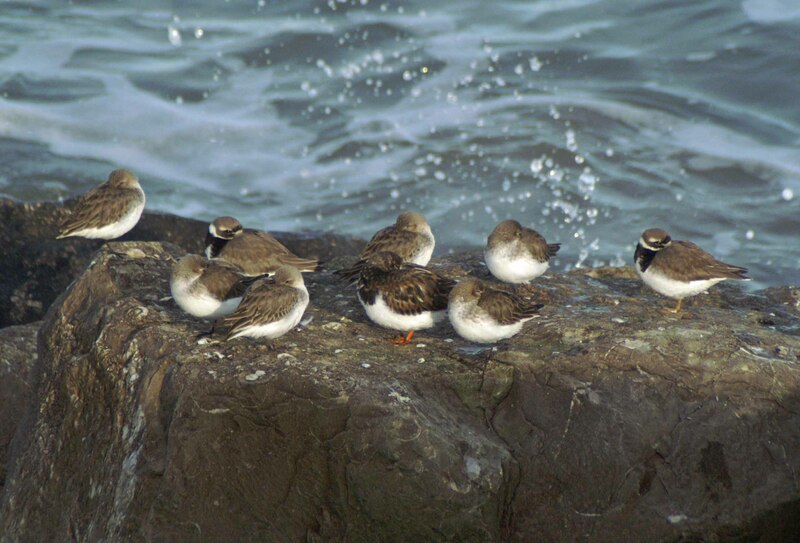 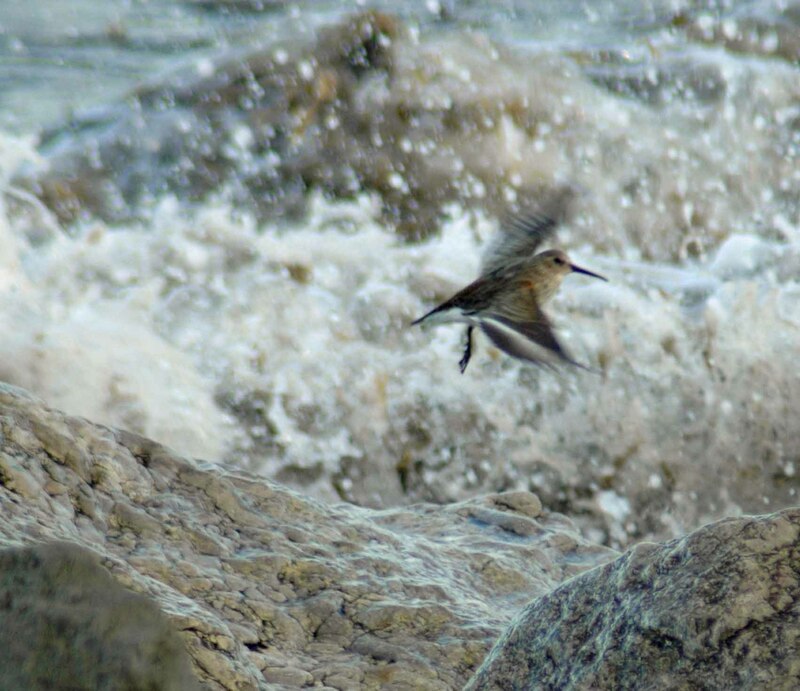 Mixed flocks of the birds line up along the sea edge, moving closer inshore as the water encroaches the rocky beach. 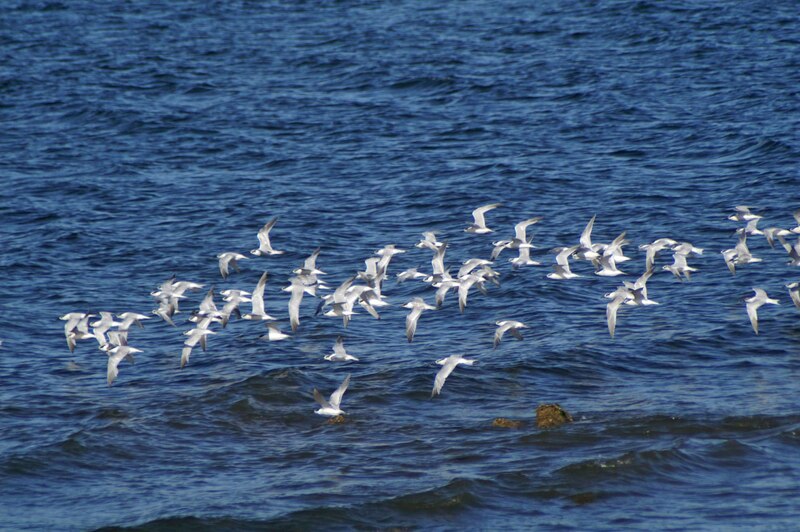 The Terns are restless; there are a lot of to-ings and fro-ings between their various groups and occasionally a whole flock takes off in unison, only to return to the same spot seconds later. 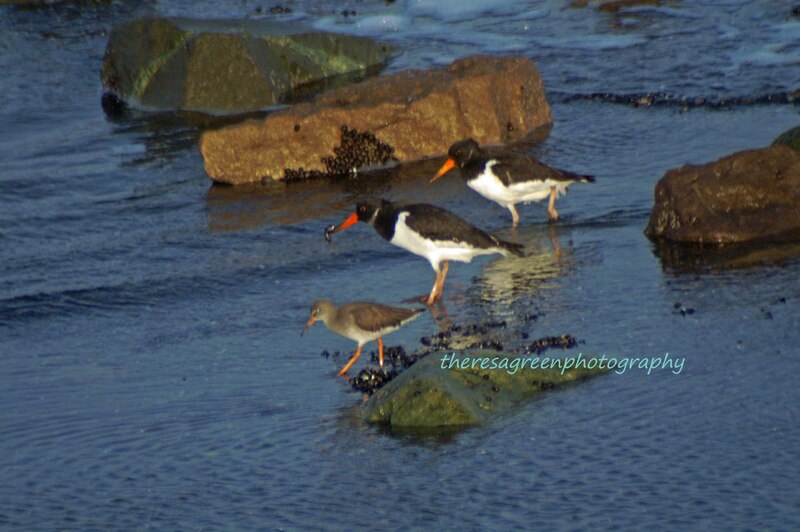 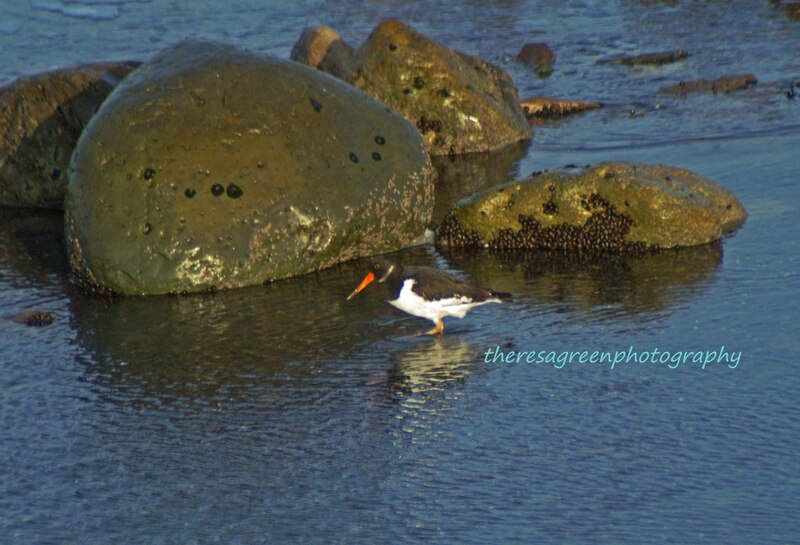 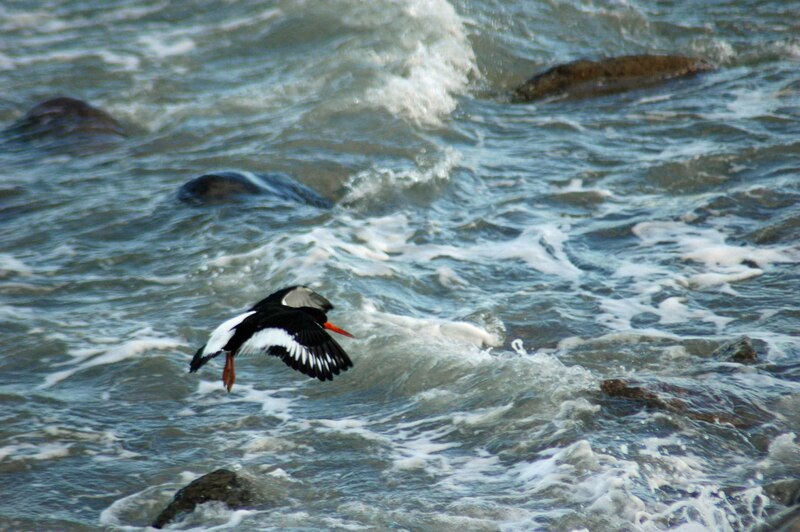 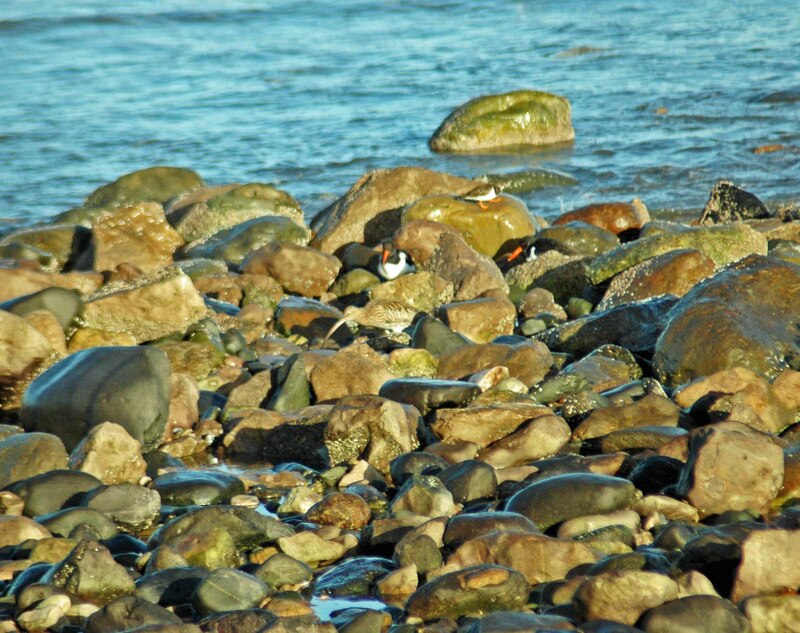 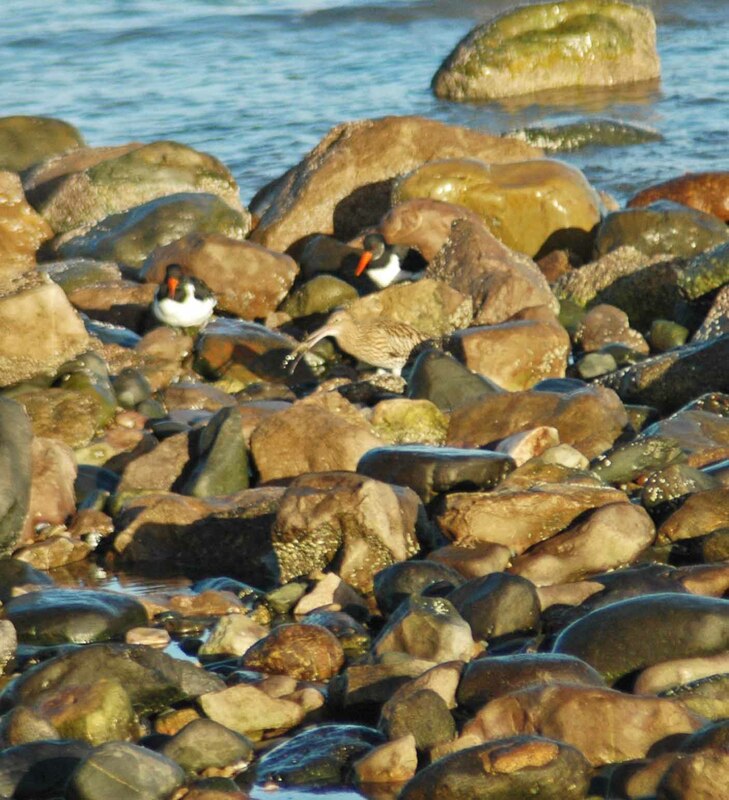 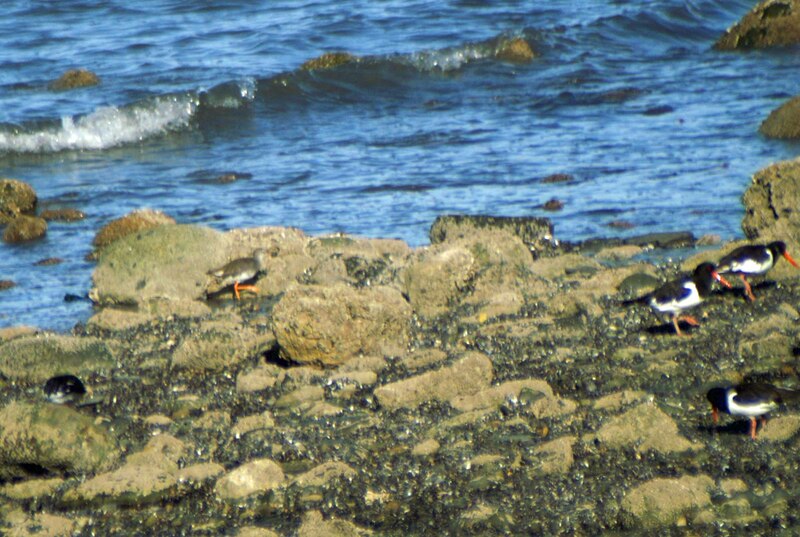 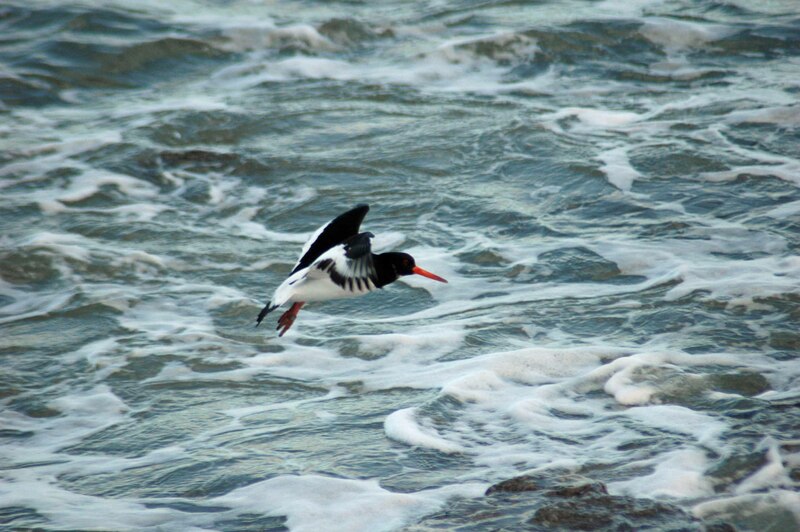 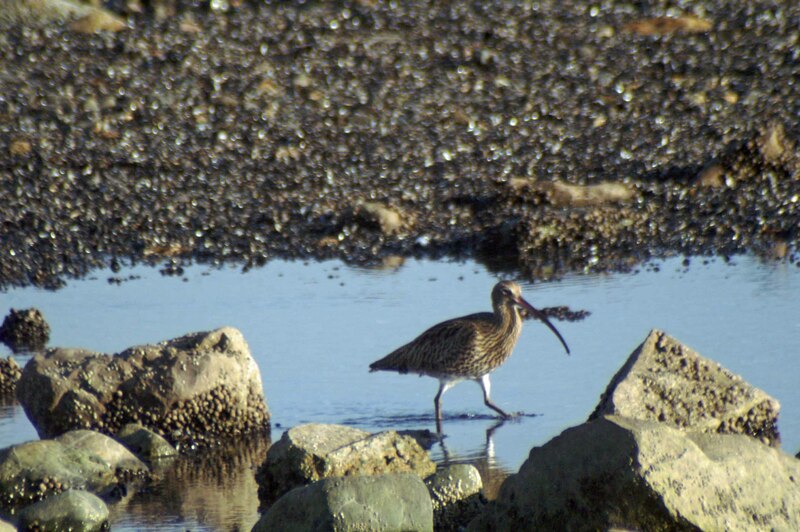 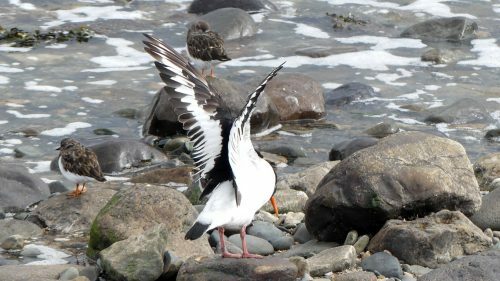 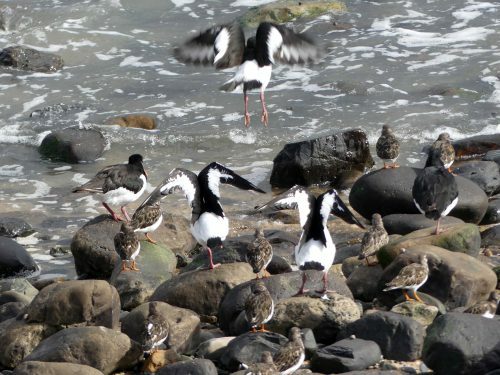 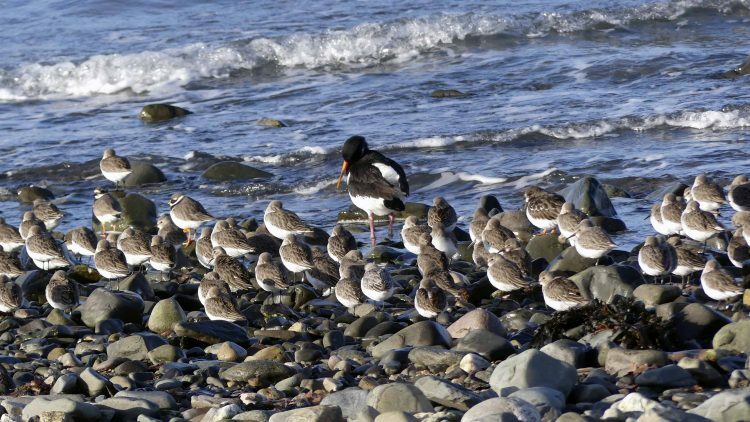 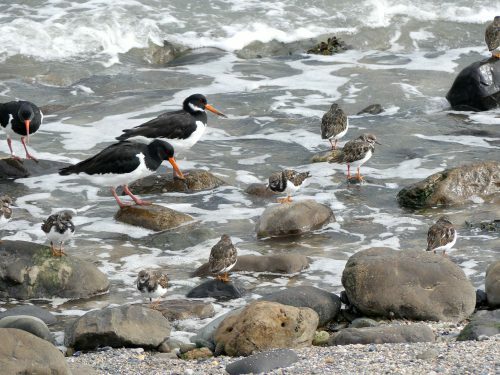 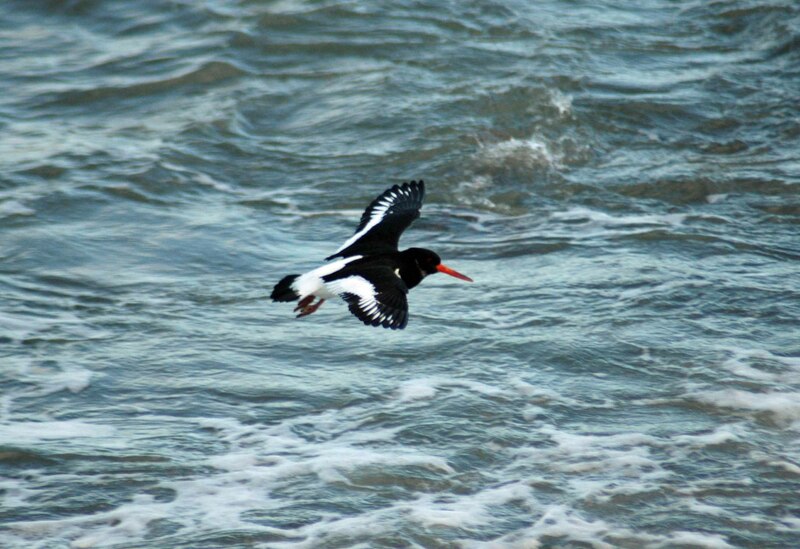 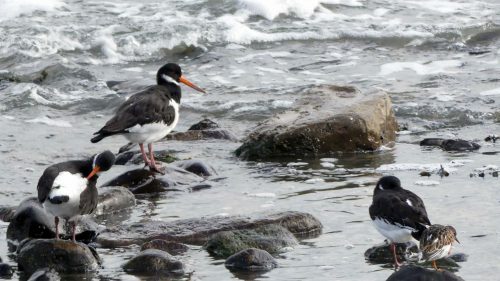 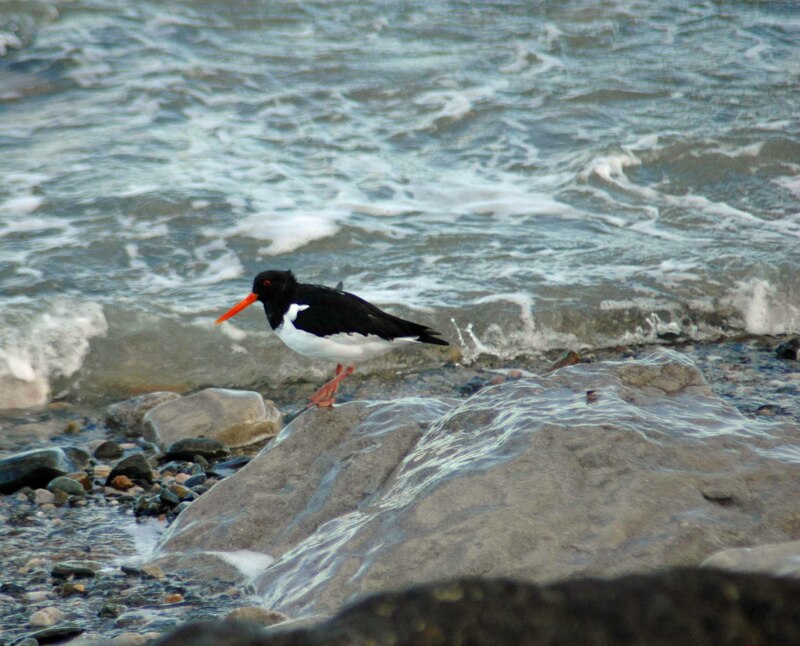 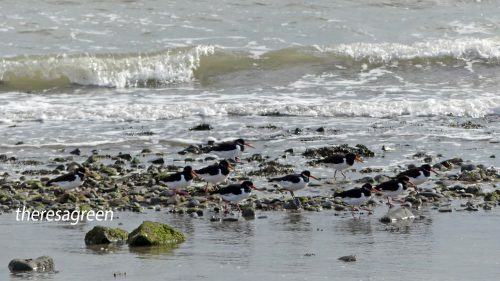 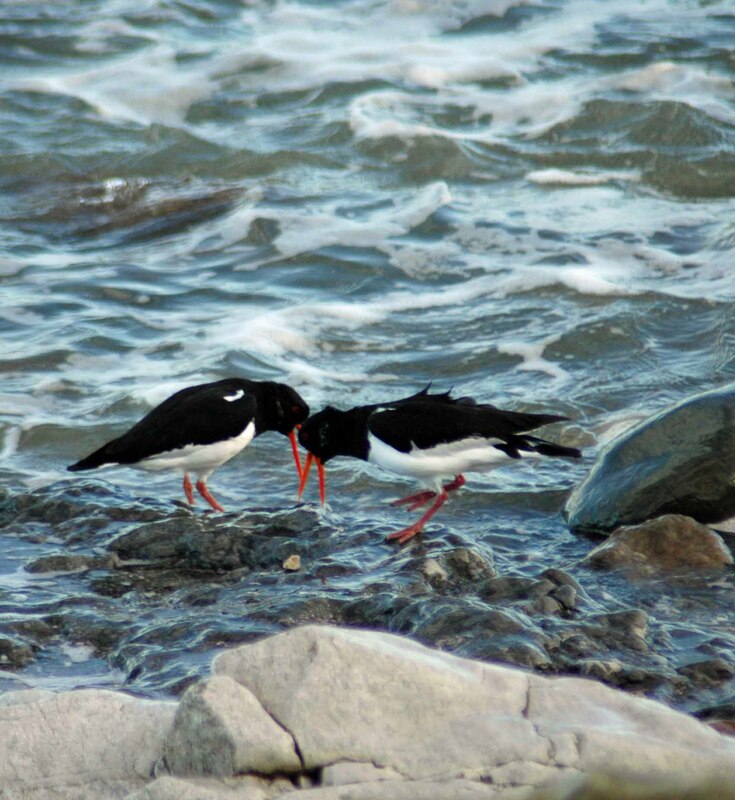 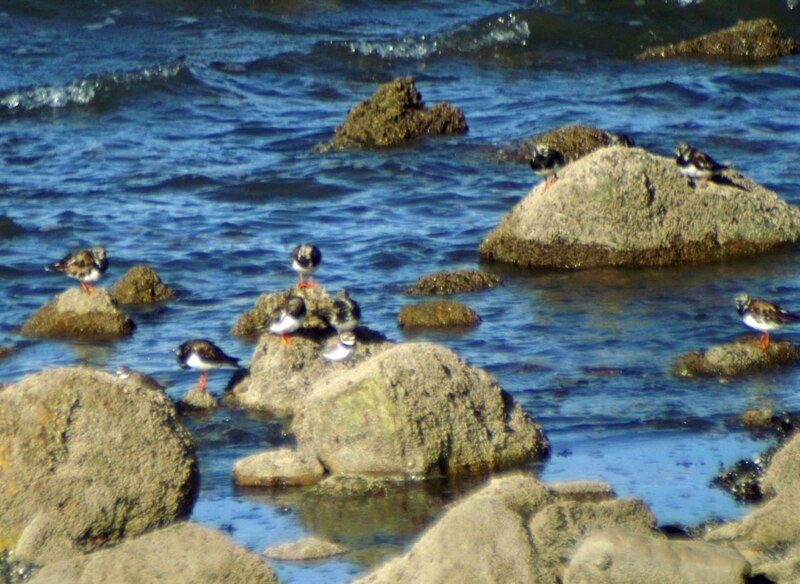 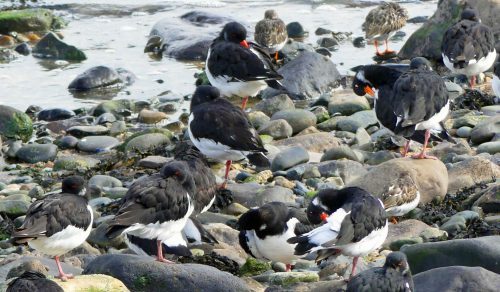 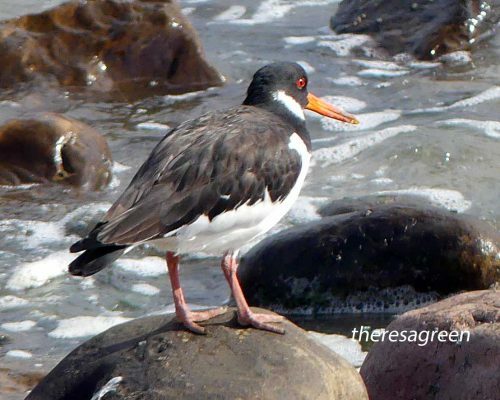 The Oystercatchers take little notice of their flighty companions and continue to wait or forage patiently. 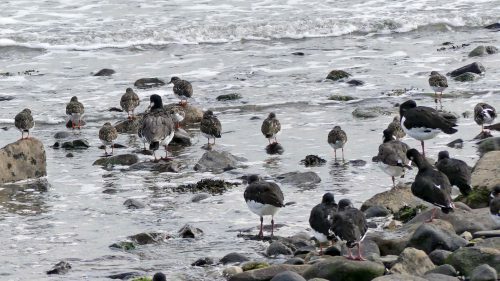 I was content watching the Tern displays, then noticed a couple of other waders well-camouflaged against the greys and browns of the shore; the bright red legs that give the birds their name gave away Redshanks that had infiltrated the ranks of Oystercatchers. 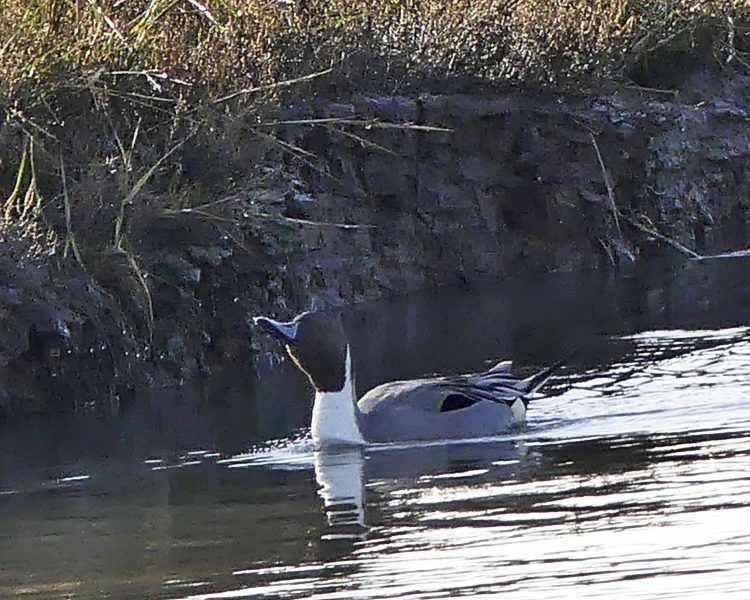 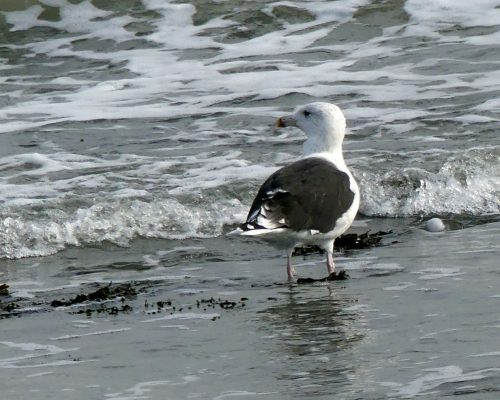 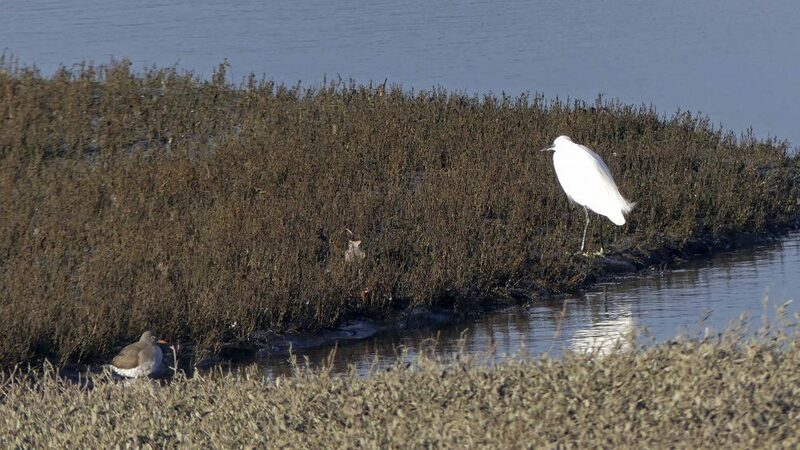 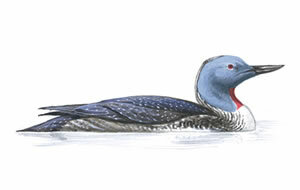 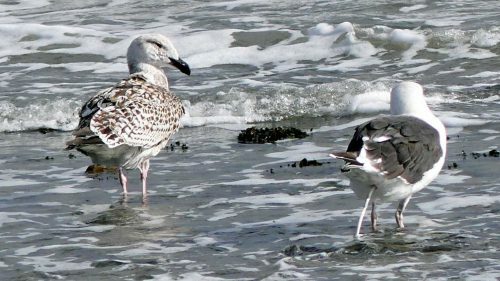 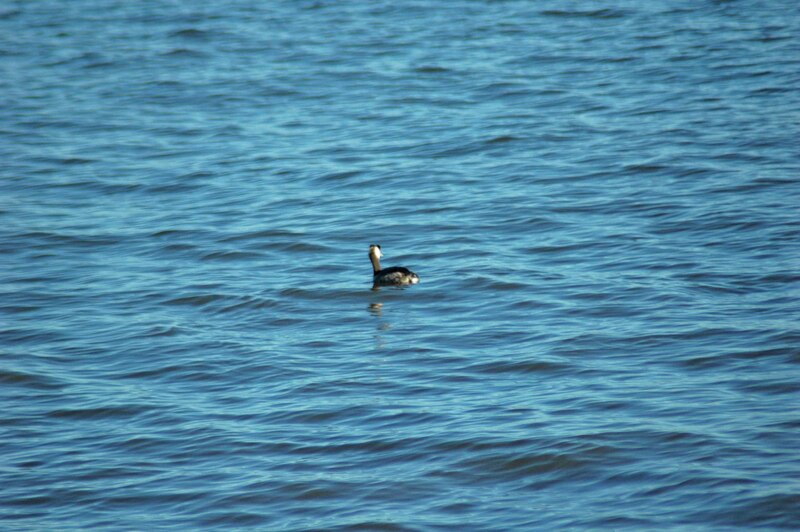 The proximity of the two species shows the contrast in size. 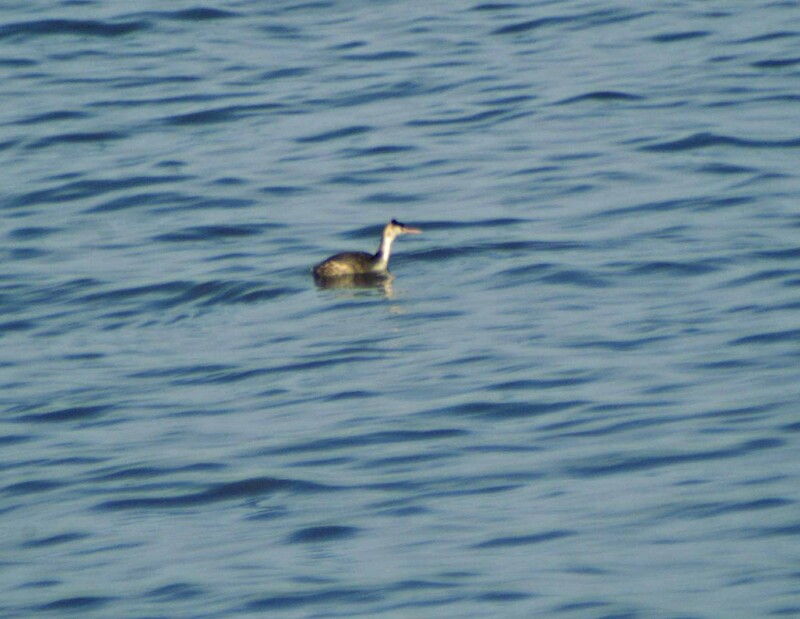 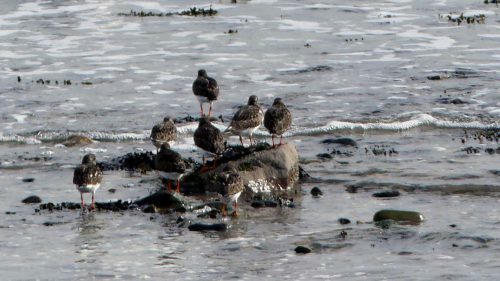 The Redshanks were quite distant, but now I have seen them I hope for better views another time. 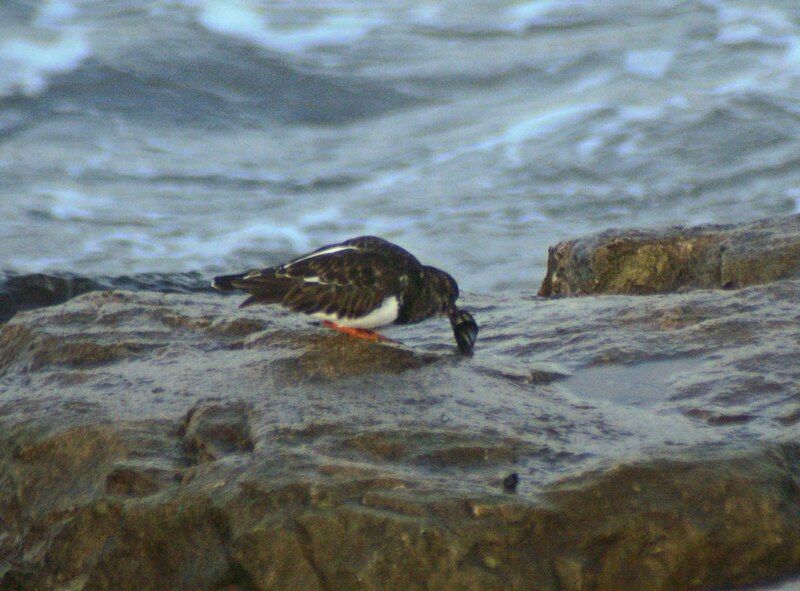 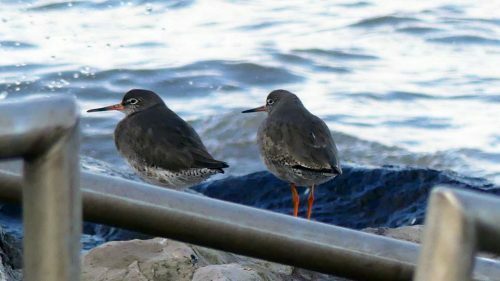 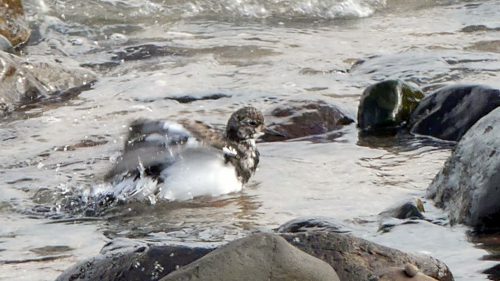 I was feeling pleased to have Redshank to add to my sightings list, then spotted two separate flocks of smallish birds fly in almost simultaneously and was delighted to witness the arrival of both Turnstones and Ringed Plovers. 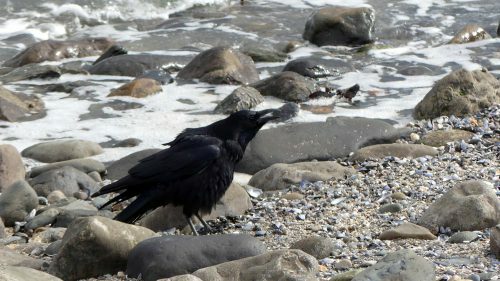 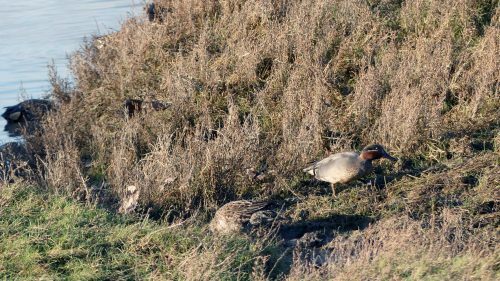 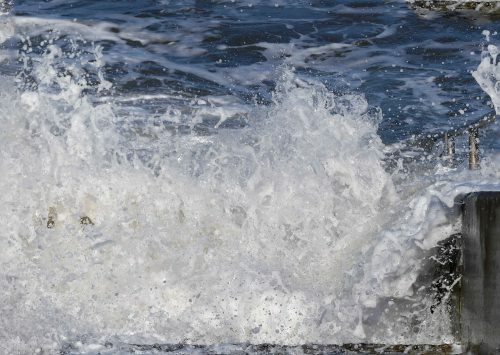 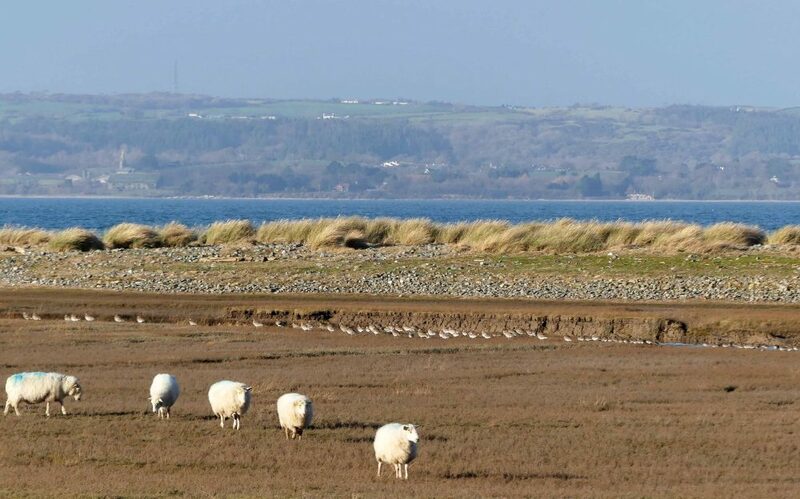 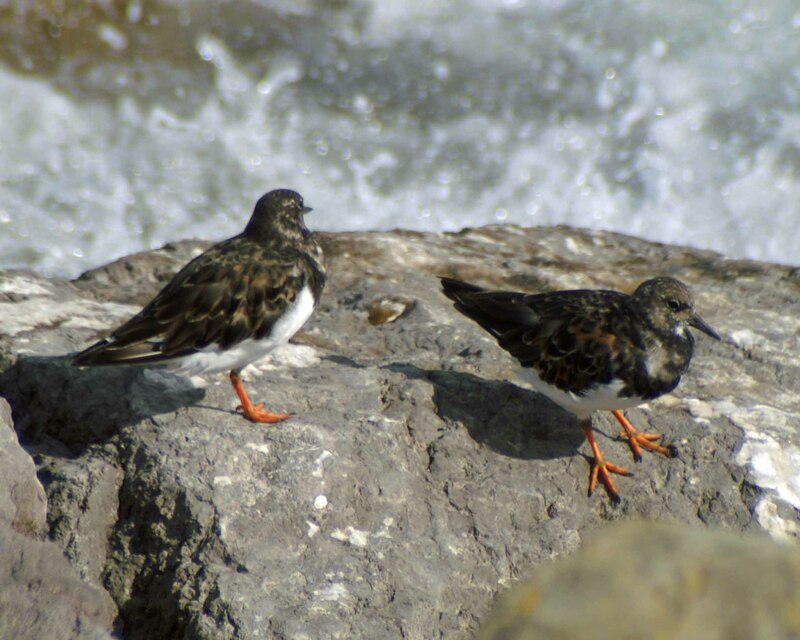 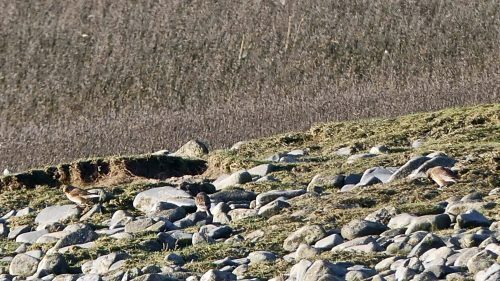 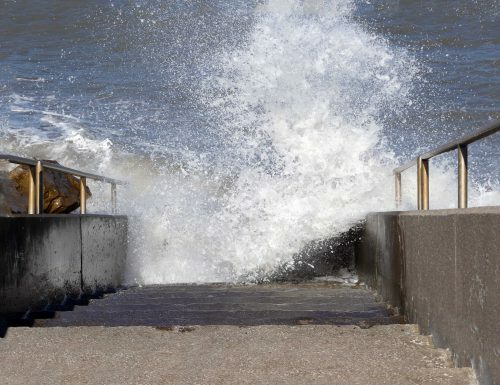 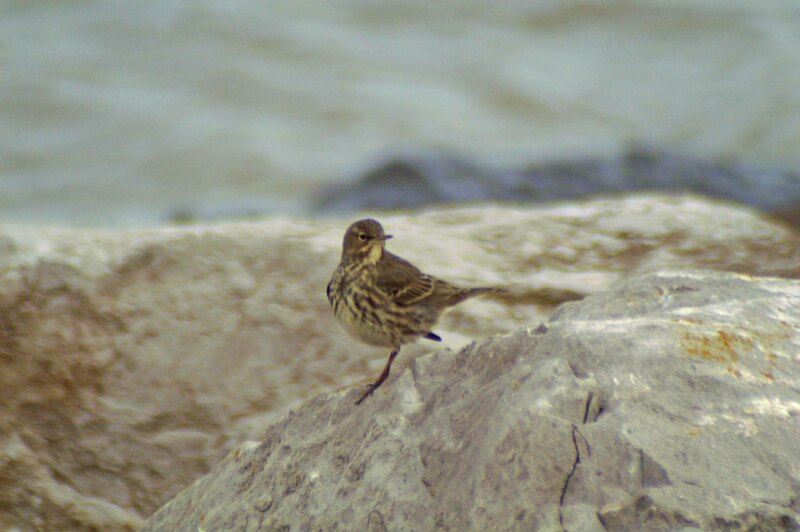 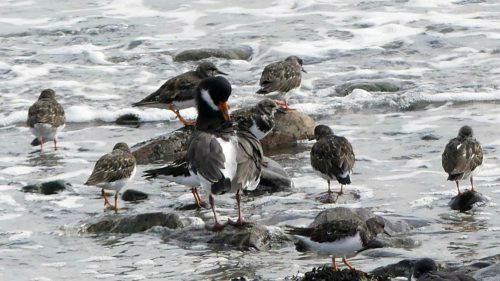 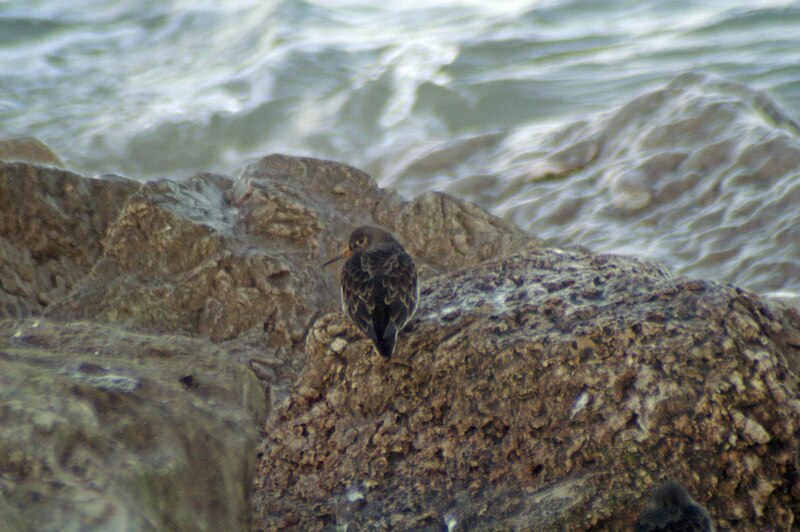 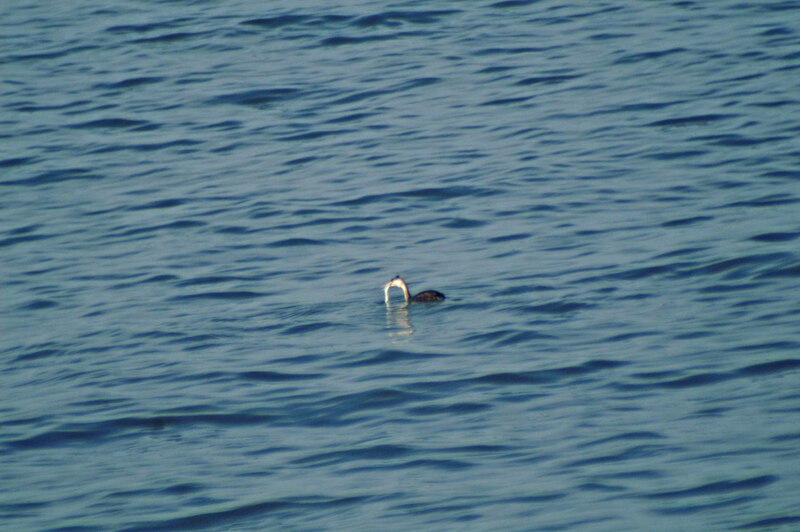 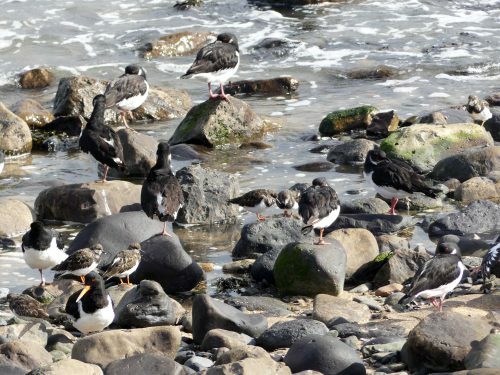 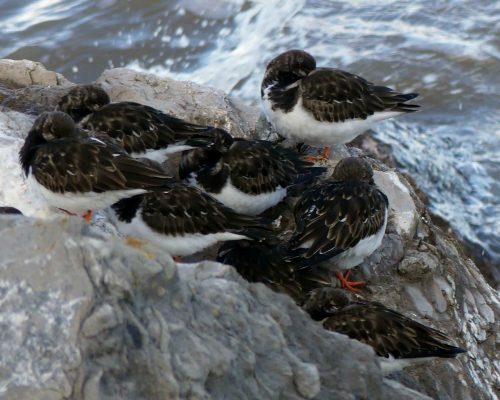 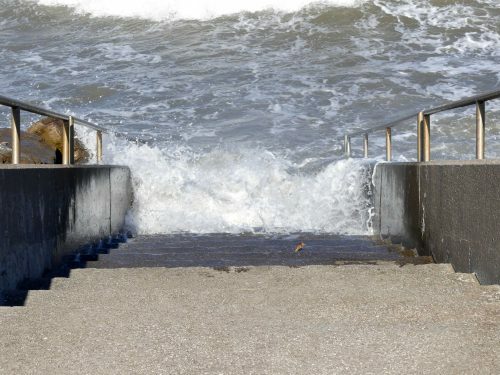 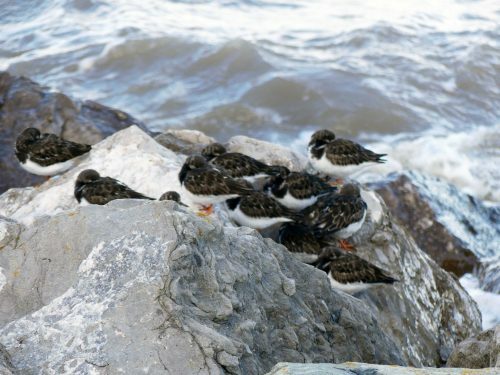 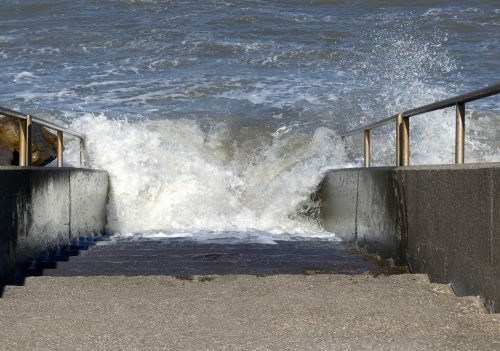 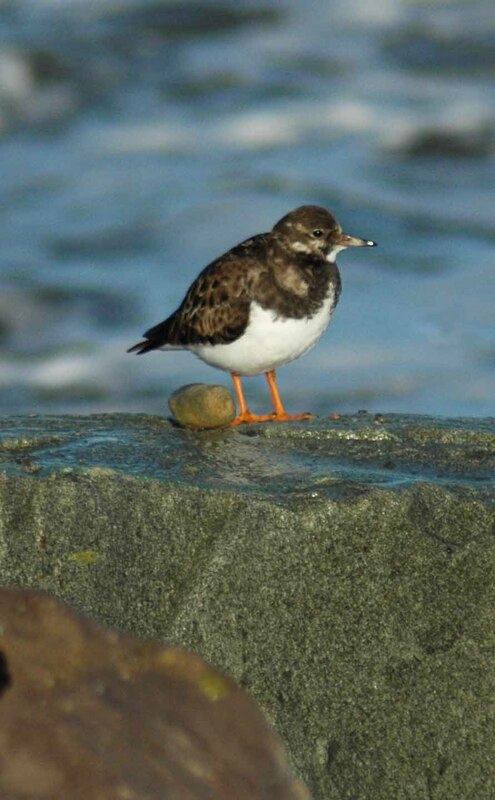 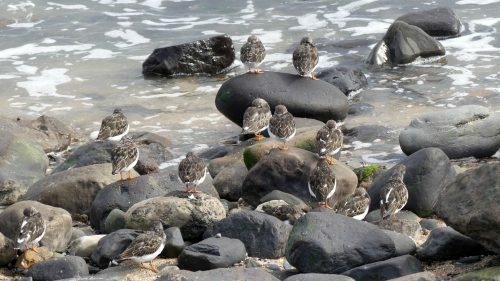 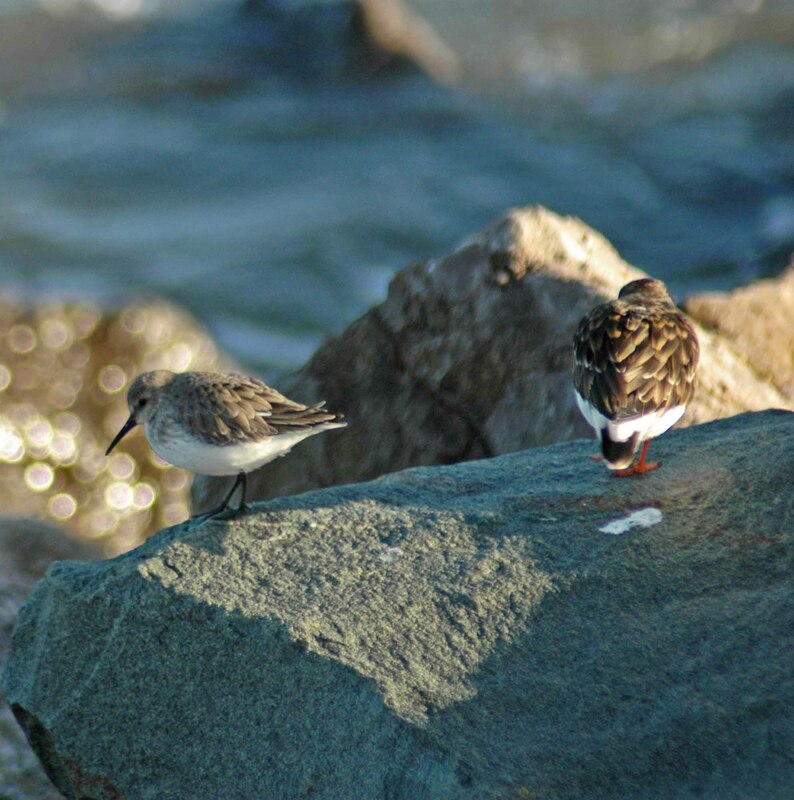 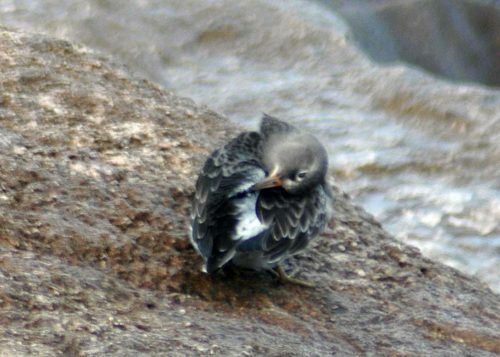 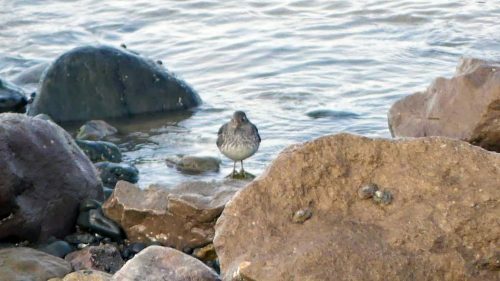 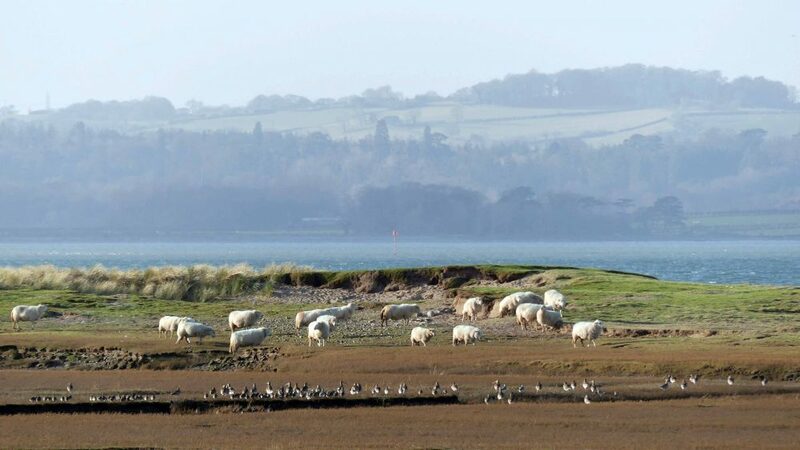 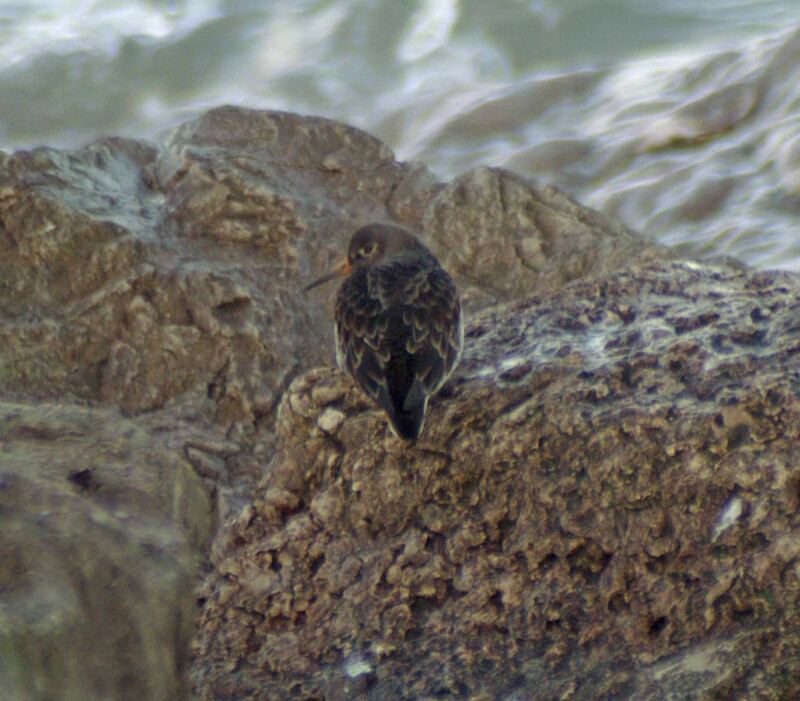 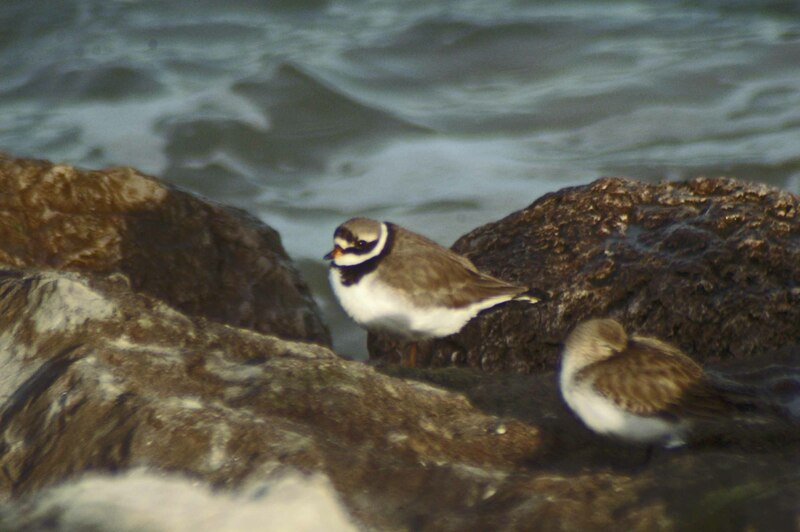 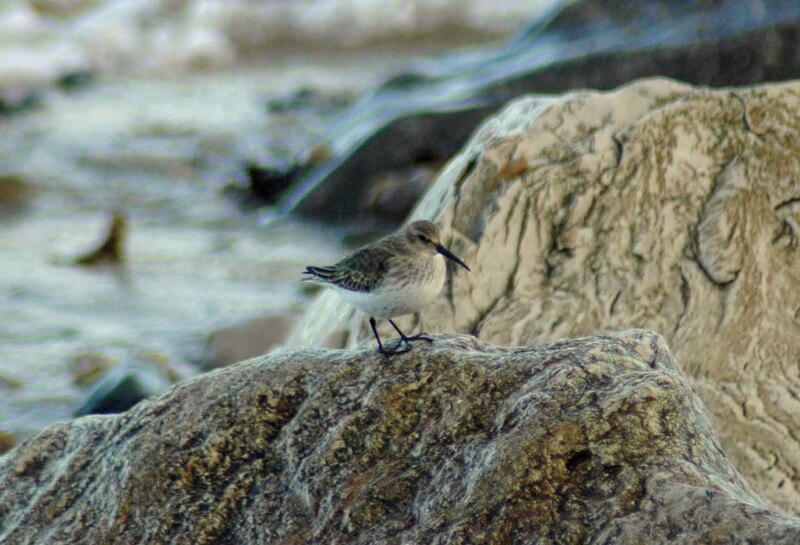 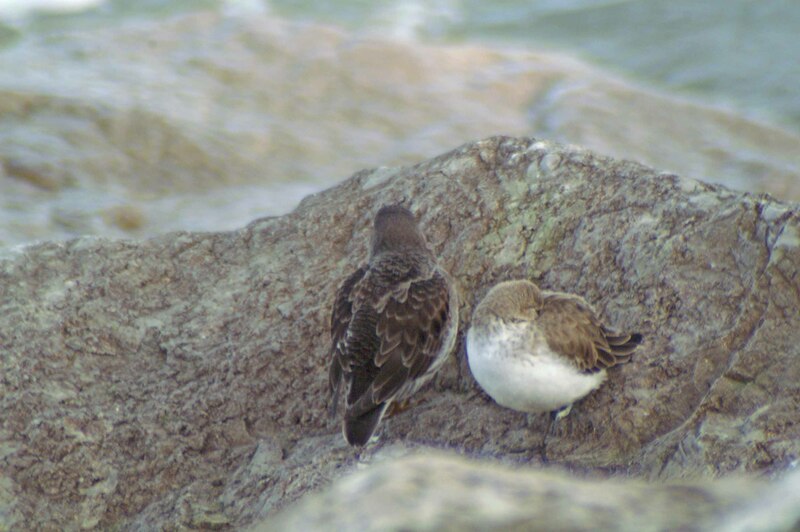 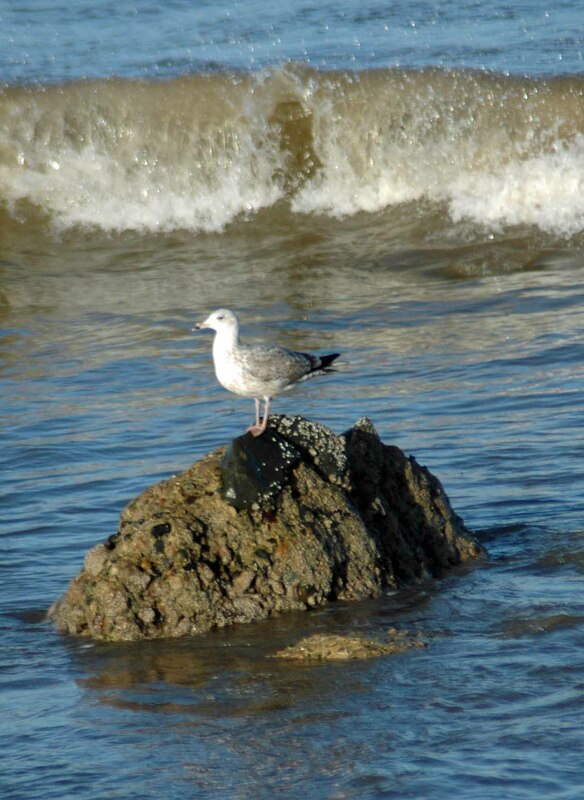 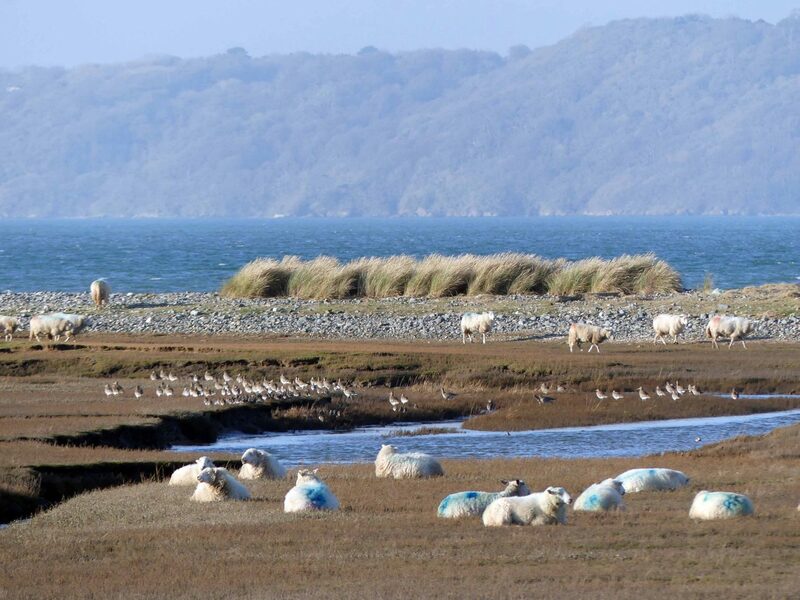 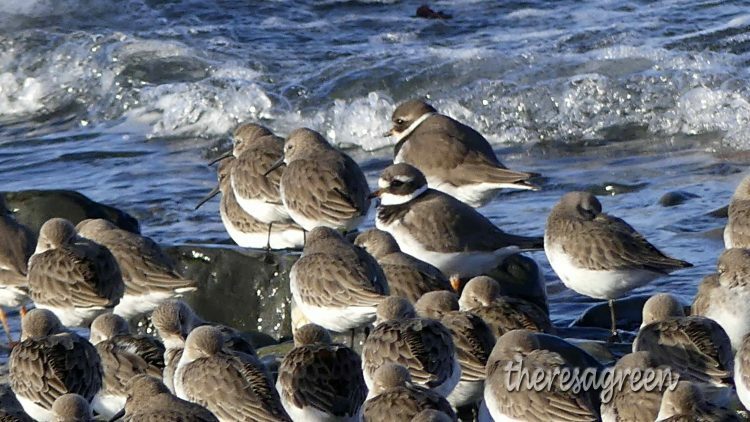 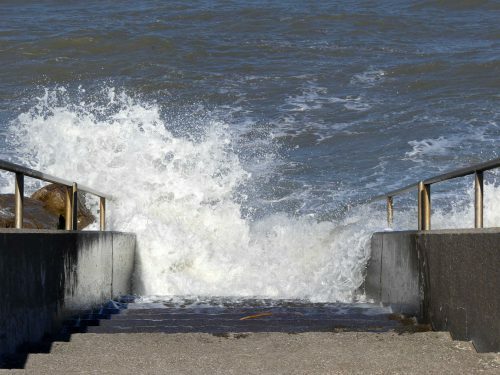 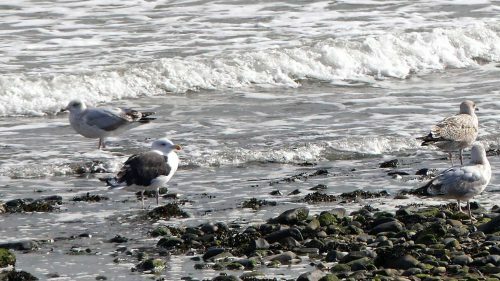 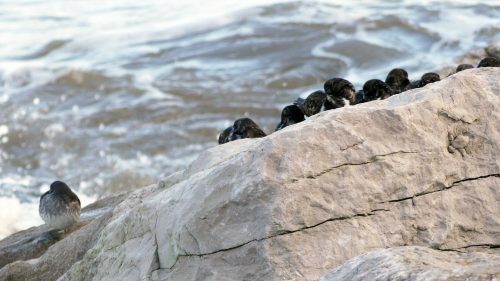 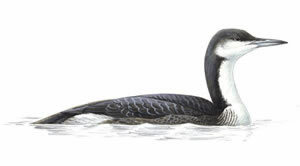 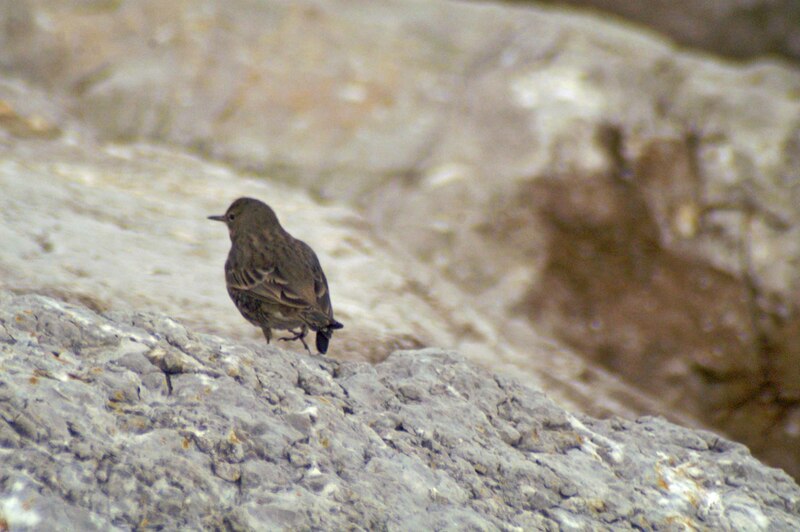 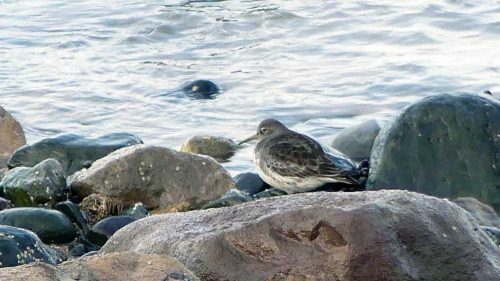 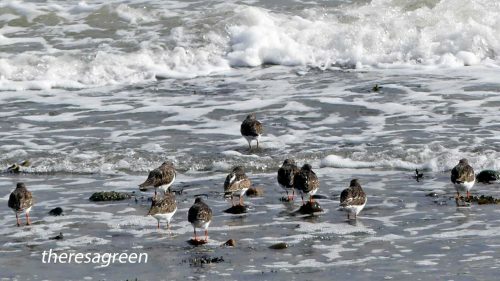 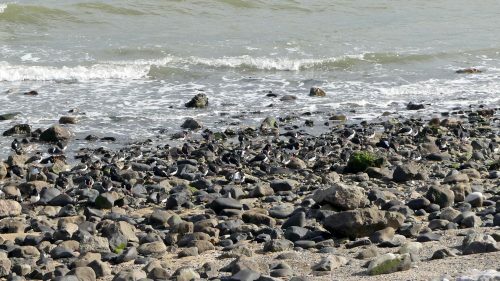 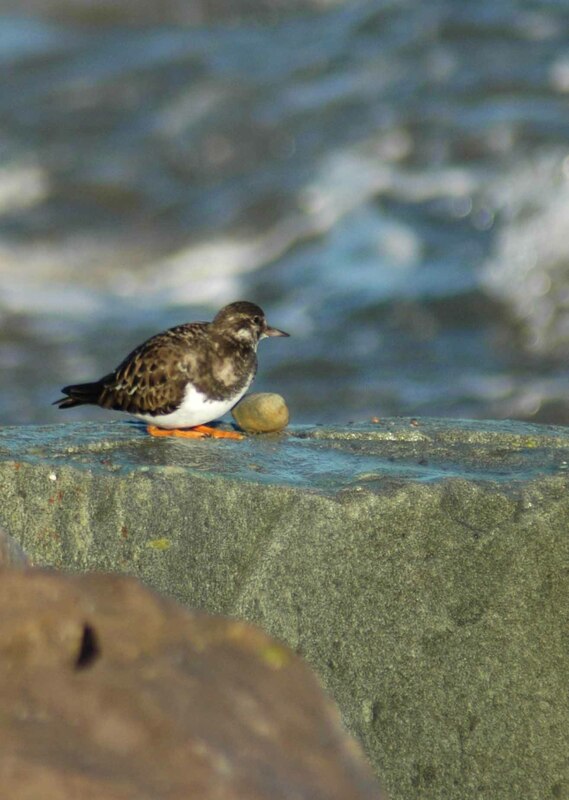 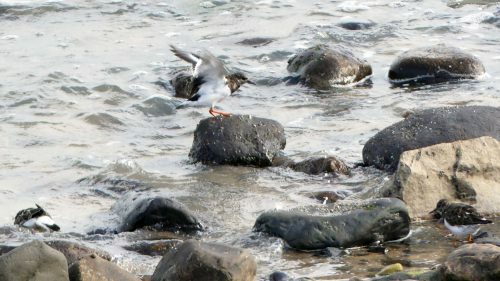 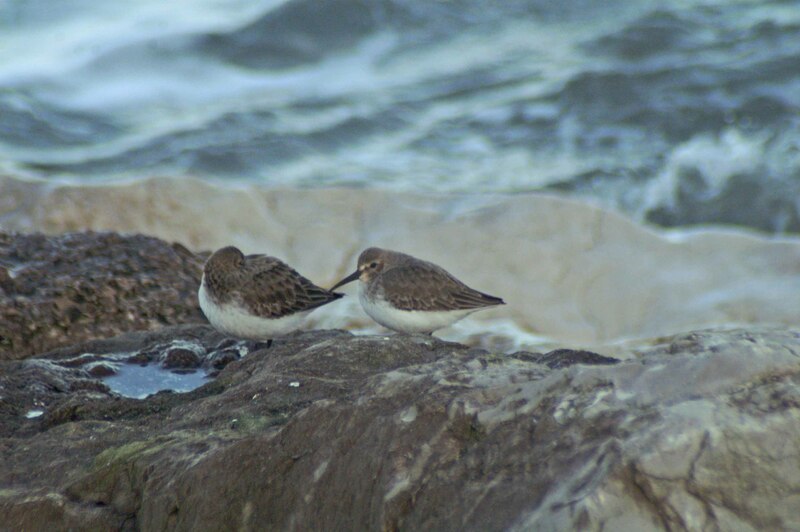 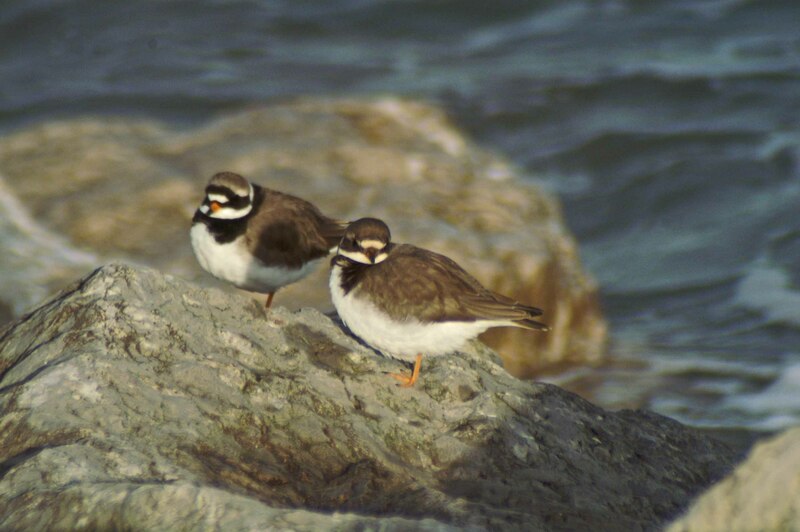 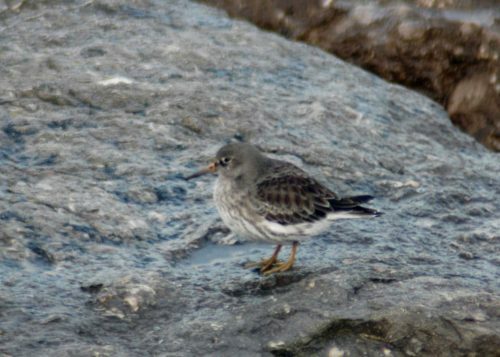 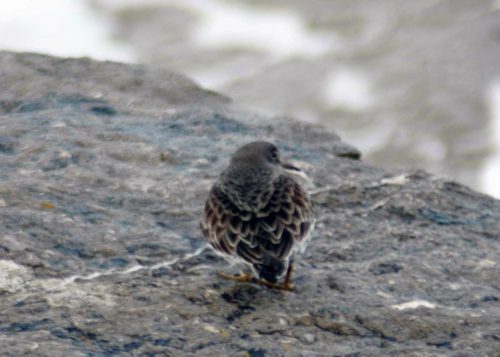 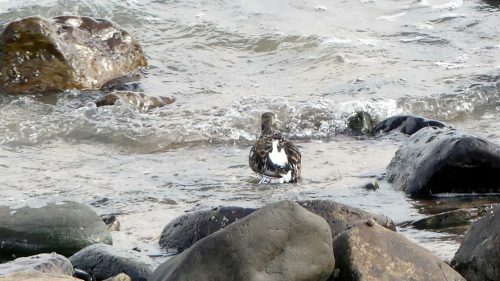 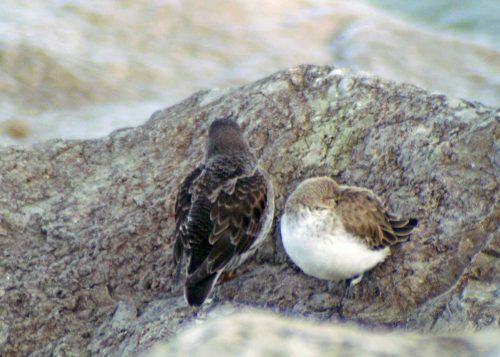 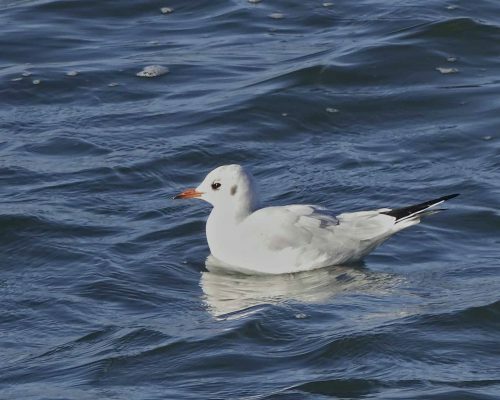 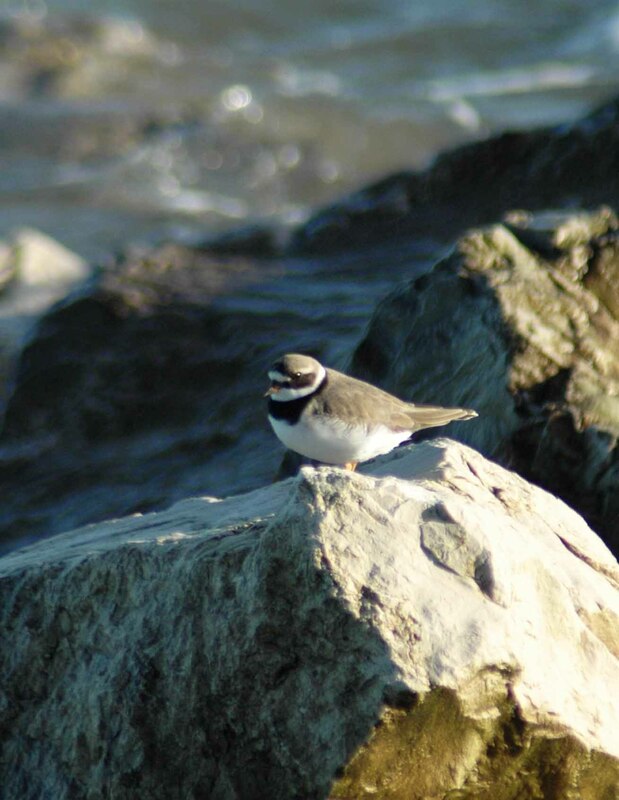 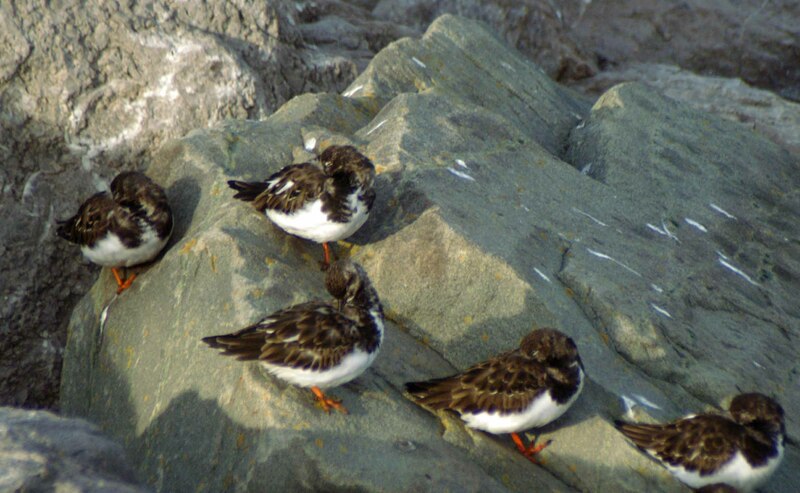 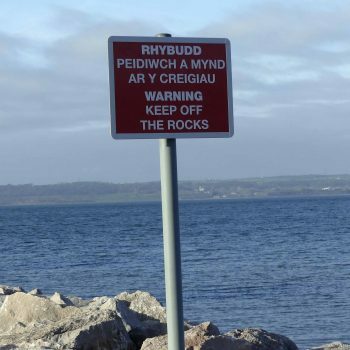 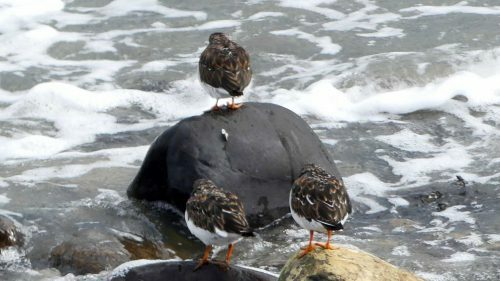 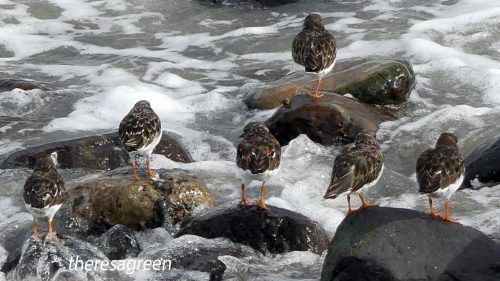 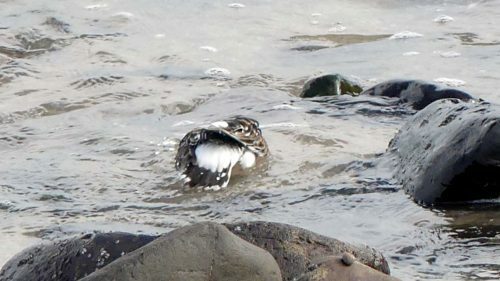 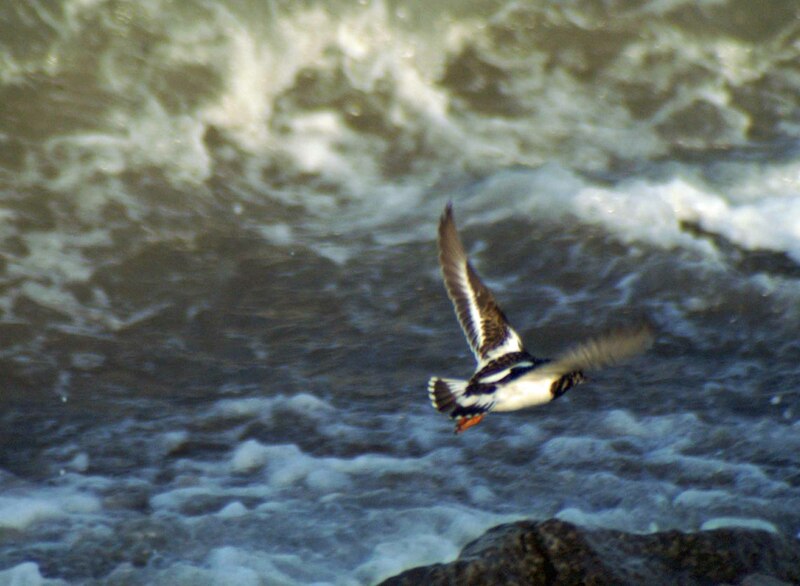 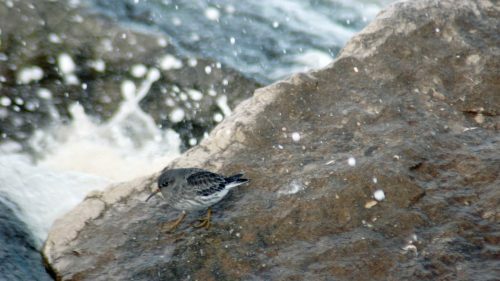 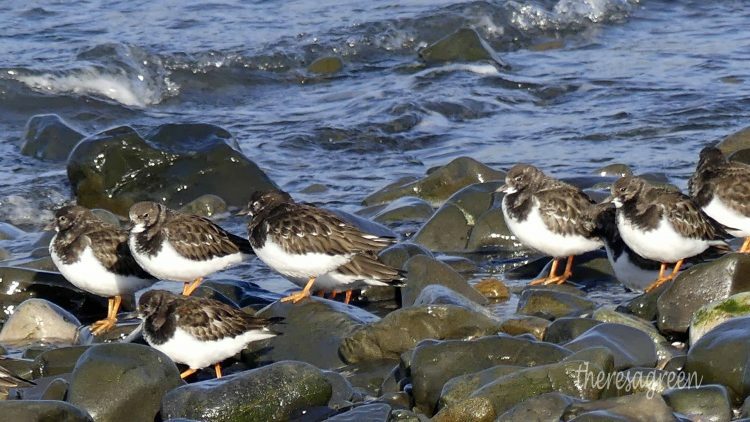 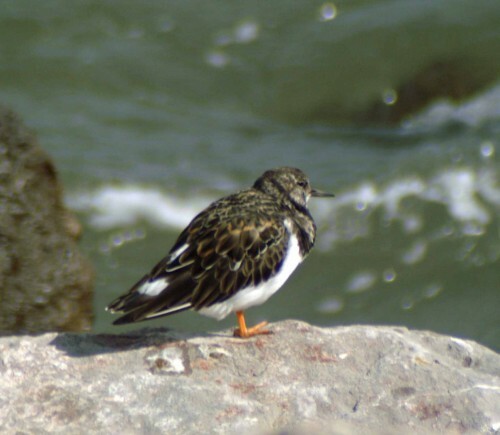 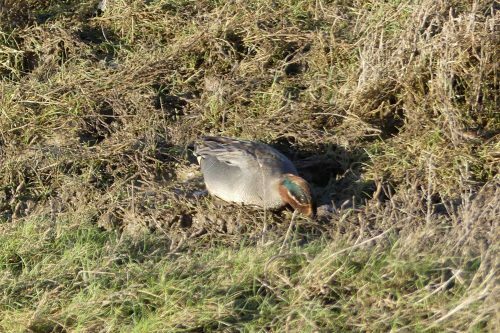 The individuals of both flocks landed on rocks at the sea edge that were surrounded by water, then stayed put for a few minutes before venturing on to the shore to forage. 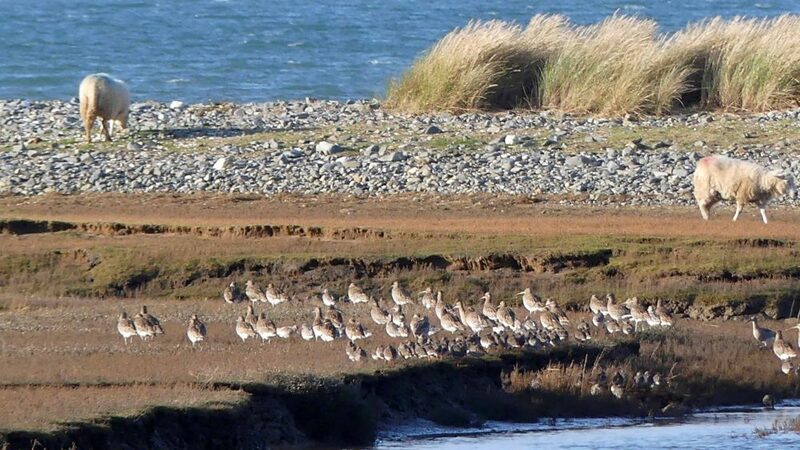 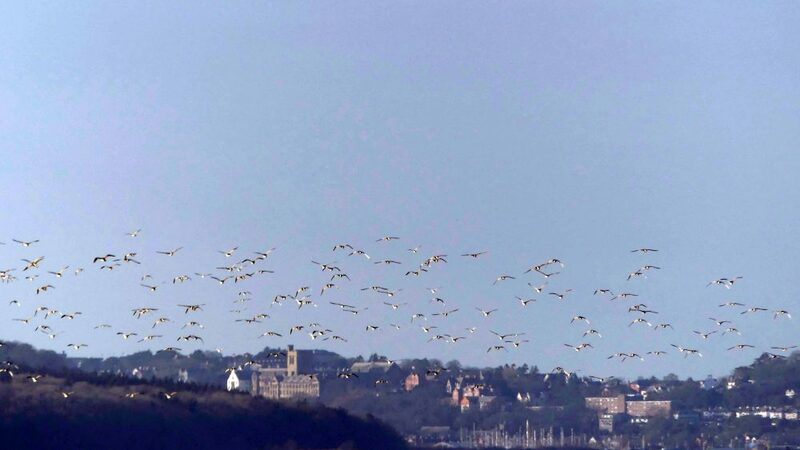 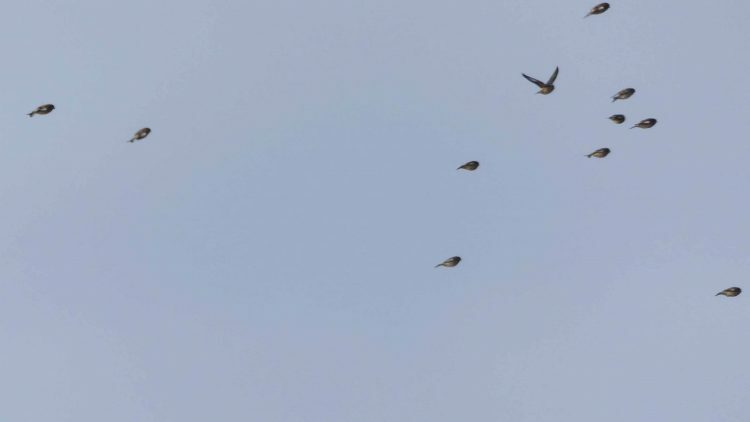 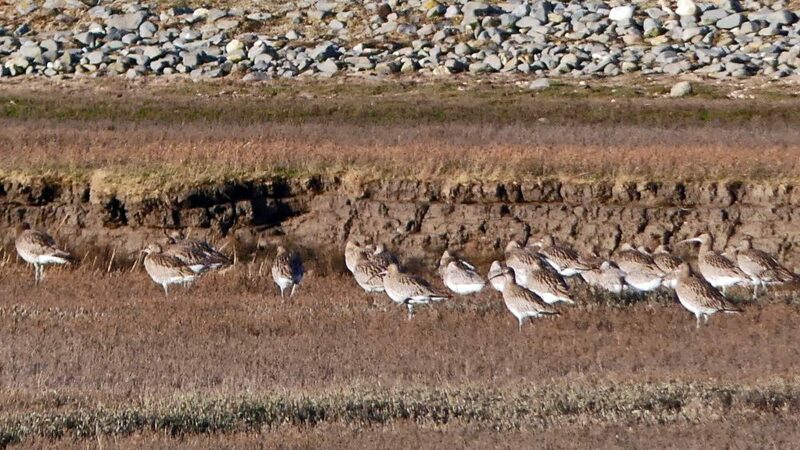 I estimated that there were around 20 birds in each flock.